This page "UNDER CONSTRUCTION". I have not put any new updates that I have been receiving from friends/customers for the past 2 years. Please be patient as I go through all the GREAT testimonials I have received and put them up. 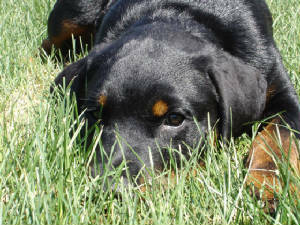 I am also going to try to put all the same dog pictures together so you can see how they are developing as they grow. 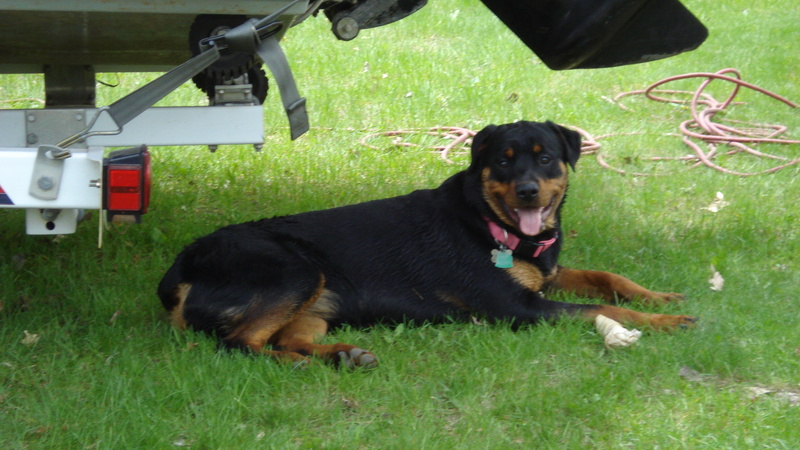 We just got back from the lake and we wanted to send pictures of the "FISH" (Roxy). 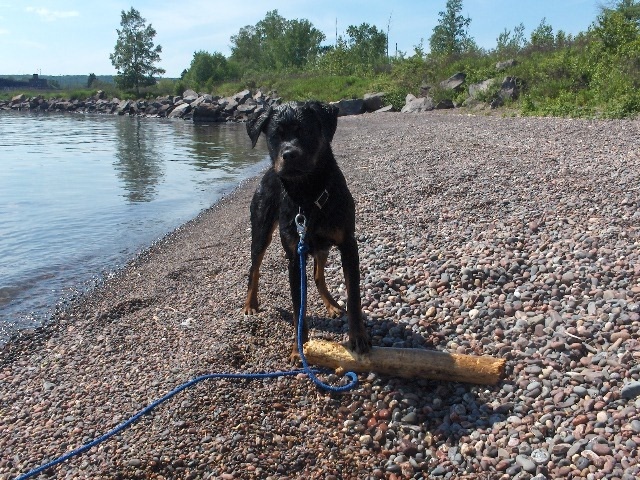 The stick that she fetches is quite heavy but she doesn't have a problem with it. Hope everything is going ok. 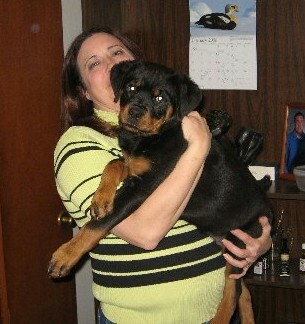 Attached is a new picture of Roxy taken 2/27/10. She is now 36 lbs. We will be getting her spayed in a couple of weeks and we will send you a copy of the paperwork. We hear you are going to be moving in June? We were planning to come for a visit with Roxy in the fall. Please give us your new address/phone number when you can. Puppy school is going great she has made a lot of friends and seems to enjoy the classes. We only have two classes left. We hope to see her picture on your site. Panzer is huge! We are glad she is staying on the small side. He is doing very well!!! He has been potty trained for about 1 month, with the exception of a few accidents about 10 days ago. He still sleeps in kennel near dog door so he can go out when he pleases (only has access to kennel and outside when sleeping). His bark is starting to get deeper (yeah). He absolutely loves to chew on ice cubes. 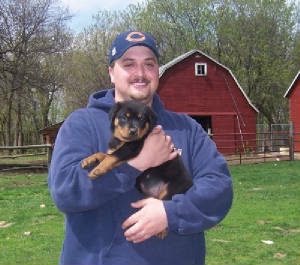 The picture below is a picture I took of "RED MALE" "TITUS" and his new owner "JAMES LAURINAITIS" NFL Line Backer for the St Louis Rams. 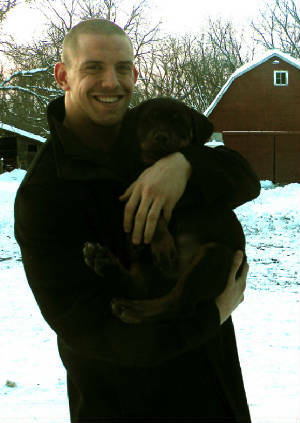 James' family purchased a puppy from me about 3 yrs ago and now came back again to me for their 2nd puppy in their family... James' father was the "Animal" Joe Laurinaitis, one of the Pro Wrestling Team "THE ROAD WARRIORS". The Laurinaitis family is a Great Christian Family and I am very pleased to be able to place another puppy into their care. 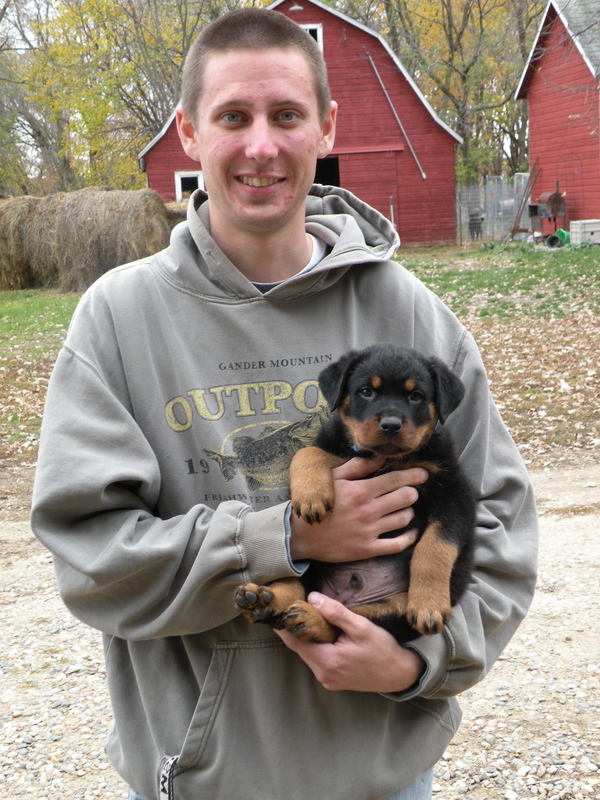 Not ONLY did I place 2 of my puppies into their care but they had also referred me to a good friend of theirs who use to be a Minnesota Twins player named "Scott Leius" which I have pictures of further down this page. 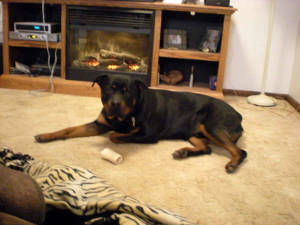 The pictures below are just a few of the pictures I received from "Panzer's" (Teal Male) new family in Oregon. As you can tell in these pictures that "Panzer" is a VERY nice quality male and looks so very happy. 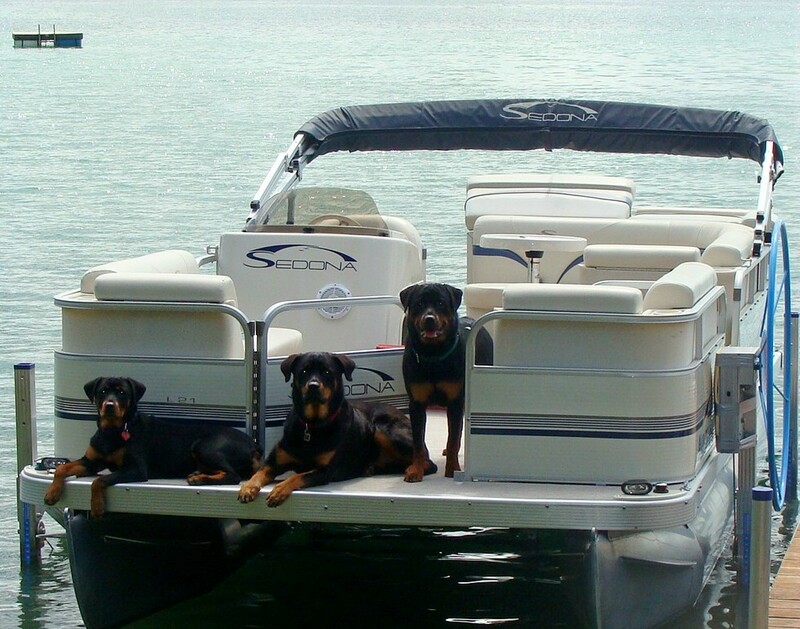 The family in the picture below is the family that adopted "ORANGE BOY" out of our litter born Oct 5, 2009 sired by "CH Enzo Von Ivan Hause" & Dam is "I-Black Angel Se Ungo-Rot". I have also attached new pictures below too that I have gotten from his new family since he has been in their home in Cloquet, MN. Jeremy & Kelly & son w/"BENTLEY"
THIS IS A PICTURE OF LAURIE & DAVE WHOM ADOPTED OUR VERY BEAUTIFUL GIRL OUT OF THE LITTER OF OUR "ANGEL" X "CH ENZO" BORN: OCT 5, 2009. 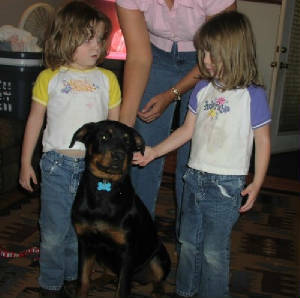 "ROXY" WAS THE PINK GIRL IN THE LITTER. 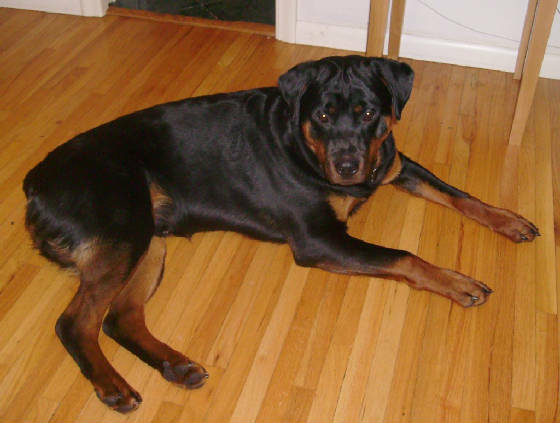 SHE IS A VERY WELL PUT TOGETHER FEMALE AND HAS A WONDERFUL TEMPERAMENT TO GO WITH IT. I MET LAURIE THROUGH THE HUMANE SOCIETY IN TWO HARBORS, MN. 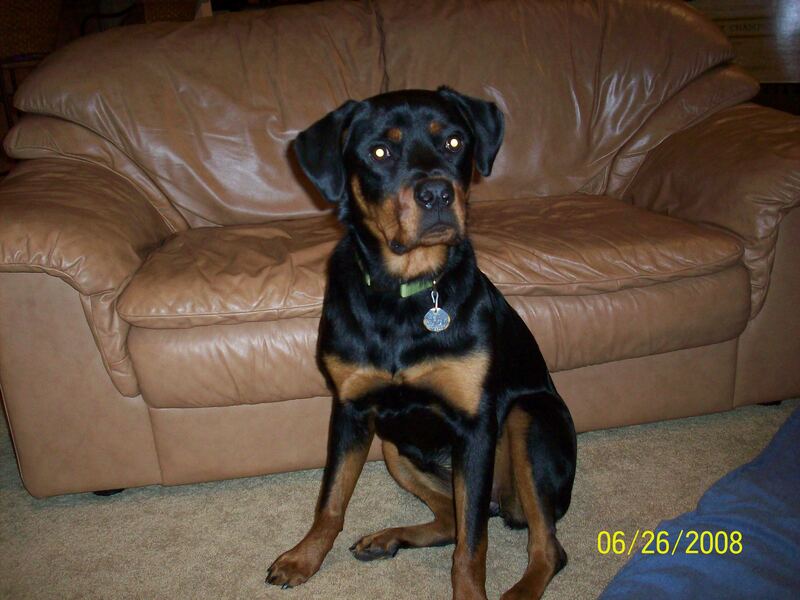 I KNOW THAT ROXY IS IN GREAT HANDS AND WILL BE VERY MUCH LOVED AND ADORED. 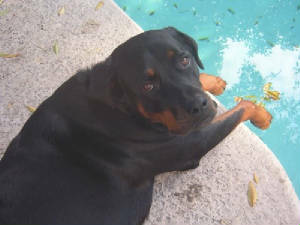 LAURIE LOST HER LAST ROTTWEILER "RUBY" LAST YEAR AND IT TOOK SOME TIME BEFORE SHE WAS READY FOR ANOTHER AS IT TOOK TIME TO GRIEVE. 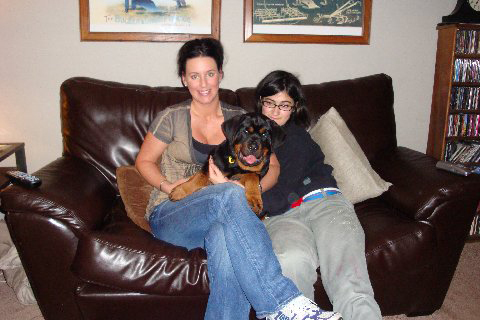 WE HAVE KNOWN LAURIE SINCE SPRING OF 2009 AND SHE WAS FINALLY READY TO MOVE ON WITH A NEW ROTTWEILER TO WELCOME INTO HER HEART AND HOME, SO SHE COULD MAKE NEW MEMORIES, WITH "ROXY". 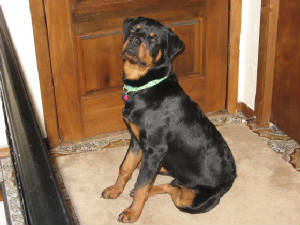 THANK YOU LAURIE & DAVE FOR CHOOSING US FOR YOUR NEW ROTTWEILER GIRL. This is a Christmas photo I received from Tony & Jennifer of their family. The dog closest to Jennifer is "Bronko" which is the dog they adopted from me. 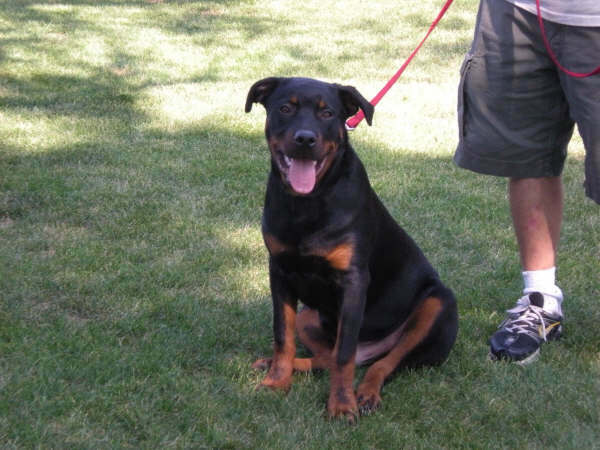 Two of the other dogs (Rottweiler & mixed breed) are from the shelter and the other Rottweiler is from another breeder. 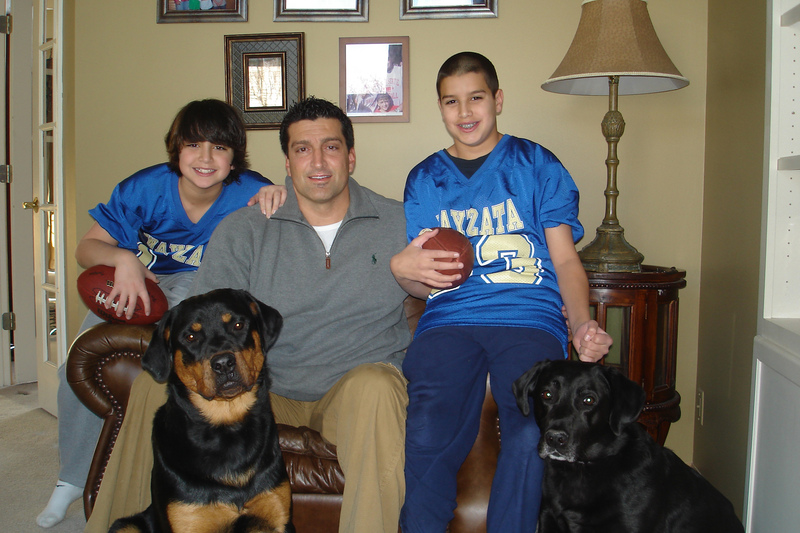 Thank you so much you guys for sending this wonderful picture of your family. They are MOST definitely in a GREAT home. Hi Ona...we want to wish you and your family a most blessed Christmas, and that the Savior's birth may bring you peace and joy, now, and for the coming year!! We hold you up in prayer daily, asking the Lord to bless you in all you do. We treasure our friendship with you, and the faith in God that we share. Thank you for everything!!!! Rory (that incredibly handsome boy) was to the Vet today for his yearly exam, and vaccinations. His Doctor had him do a sit, a down, etc., and both we, and he, were so proud of Rory -- he behaved perfectly!!!!!! Rory is a wonderful, and fun pet! He is very smart, and extremely affectionate. 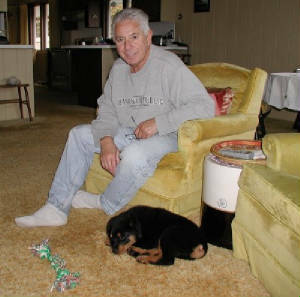 He and Nica are best ever friends and playmates...they have a great time together. 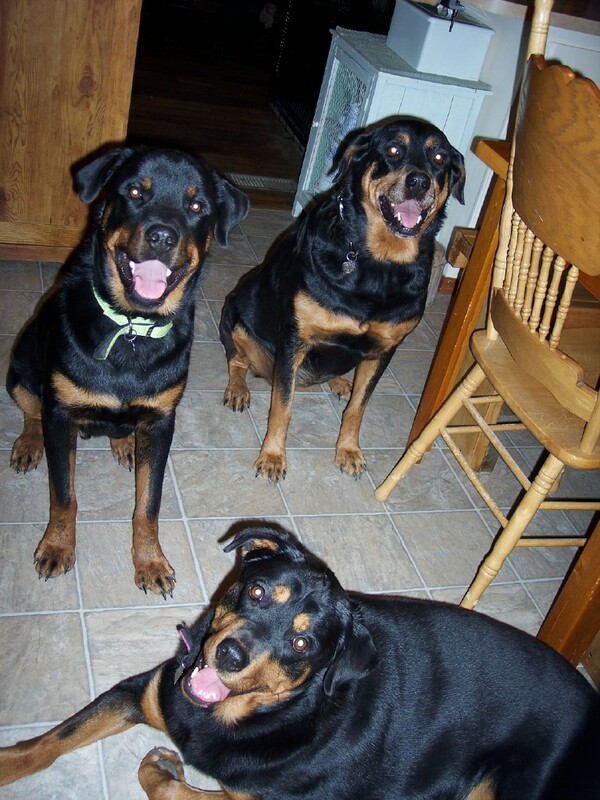 We are so pleased, and proud of our three Rotties...thank you Ona, for allowing them to be our family members!!!! We have a huge winter blizzard on the way, so today we went to town and made sure we had enough people, and pet groceries to go for several days. We should be ready for anything now. We never go anywhere for holidays, we are just homebodies!!! Hope all is well with you, and that you are looking forward to celebrating the birth of Christ! Have a wonderful day, you will be in our thoughts and prayers!!! "Storm" is a VERY LARGE boy at ONLY 9 1/2 months old. 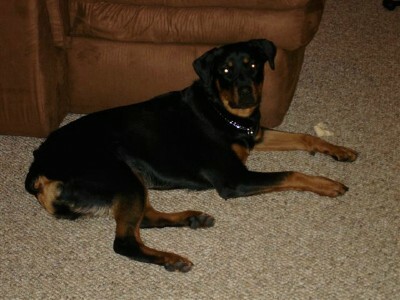 He is a very laid back boy and has fit in well with his new family. Yes, we are very happy with his looks. He is so cute and cant wait for him to mature. 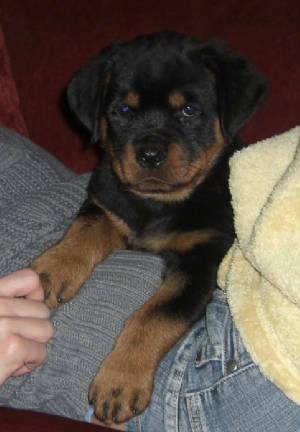 He is going to be a Gorgeous Male Rotty. Even Melissa has commented on how cute he is. 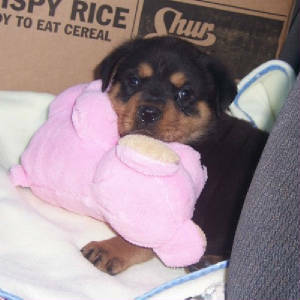 Before we got him she was telling me that the Rotty pups were not very cute and that they all look the same. Needless to say, She is very happy with his looks. We also had a guy here looking at a car and he was very impressed with Panzer's look. He said he was gorgeous and markings were very good. 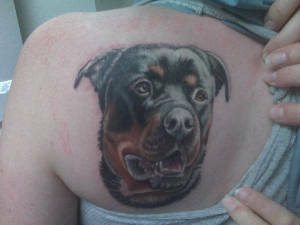 We took that as a big compliment since he has owned several Rottys and probably knows from experience. .
You can use any picture you want. In fact I need to mail you the puppy exam paper and will send a disc with more pictures (easier to download). I will get that in the mail by Tuesday. 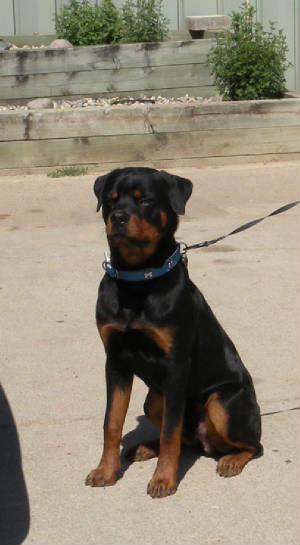 We are sending you some recent photos of Panzer. These were taken today Friday Dec. 11 (9 weeks and 4 days). He is doing very well. He knows sit, down (lie down), crawl, and crate time. He is also learning leave it, come, and doing better with biting. We have been very fortunate these past 10 days as we have had no rain and potty training has gone very well. We are expecting snow tonight/tomorrow and plan on taking him out to play. He is growing very fast, according to our scale he weighs 18lbs. How is blue boy doing? And if you get a chance we would love to see recent photos of your lime female. Enjoy all these recent pictures of our beloved Victor the spoiled dog! Can you tell? 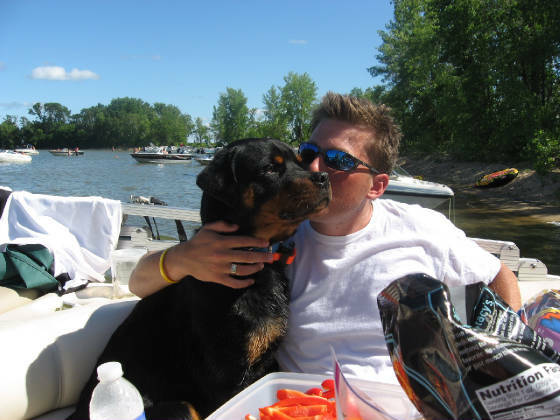 And by the way, he LOVES the Lake, the pontoon, and everything about fishing! "VICTOR" & HIS HUMAN BROTHER !!!!! SWEET PEA & DILLON MALE PUPPY!!!!! TIRED "VICTOR" & HIS TIRED HUMAN DAD !!!!! SWEET PEA & DILLON MALE PUPPY !!!!!!! Hi Ona...Wanted to let you know the photos of your home are great...you have made a lot of changes, and I bet you all are loving it!! Your website continues to be a constant source of news and information for us, you have done an incredible job!! 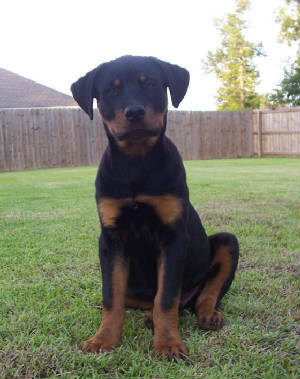 And we are awaiting news of your new female joining your Rottweiler family!! Am sending you an update on our four legged family members -- hope you got the photo okay!! You are always so busy...you make me feel lazy!! Be sure you take care of yourself! 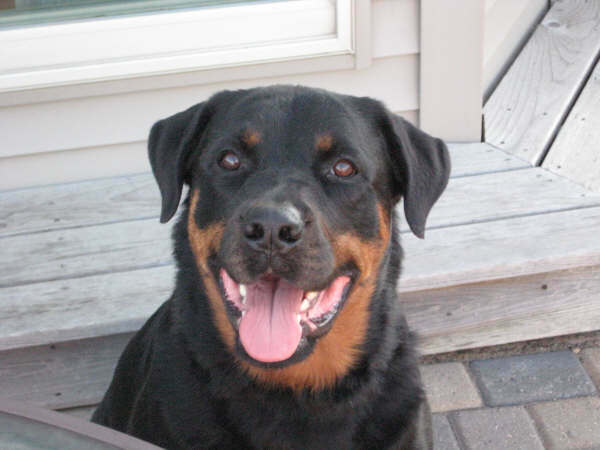 It doesn’t seem possible that it has been 6 years since we picked out Gerda (Riley x Mad Max female, June 1, 2003), on a lovely summer Sunday morning, and she left your family to become a member of ours. She is a wonderful girl...very relaxed, friendly, loving, and a wonderful companion to ALL her family members. She is very tolerant of everything going on in her home -- from baby chicks in a brooder in the kitchen, to pasture cows and calves, to indoor and outdoor kitties, and all creatures in between! She has gotten very grey in the muzzle, and loves to rest on the couch or the bed, but she is a wonderful friend, extremely loyal, and has great concern for those she loves. 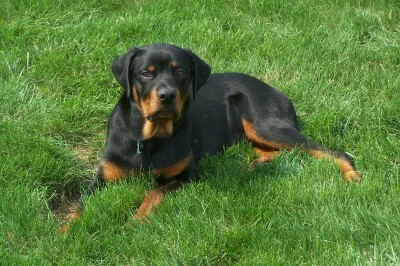 She is very steady, and really does well helping with the two younger Rotties. Her favorite activities are going to town for ice cream, and going to her beach to play in the water. She knows the roads we take to each place, and she sits in the back seat of the truck, and gives us kisses on our necks during the trip. She weighs around 120 - 130 lbs, and is beautiful!!!! 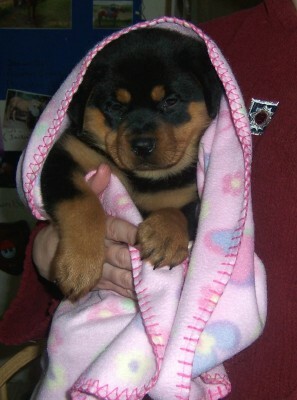 Our Nica (Nikki x Caillou female, March 8, 2006) is next...and she is a character! She is 3 1/2 years old now, and has a constant smile on her face, and has the most expressive eyes and facial movements. She is such a tease, is always very curious, and into everyone else's business. She loves to go in the other dog's crates and get their toys or blankets, then when caught, looks totally innocent, and offended that she could be the accused!!!!! She absolutely hates the outdoors, bugs, skunks, rain, snow, heat, cold, wind, but adores ice cream and watermelon. She likes to boss the other dogs and kitties, and still has many complex paw movements to show off for us. She is such a clown, and still remains very much a "puppy" in her games and routine activities. Her favorite place to catch a nap is under the crib in our bedroom! We think Nica will remain a perpetual puppy, and her adorability rating just keeps going up!!!!!! She weighs around 100 lbs. and everyone she meets loves her! And now for Rory (Sweet Pea x Dillon male, Sept.11, 2008) who just had his first birthday. What a dark and handsome guy!! 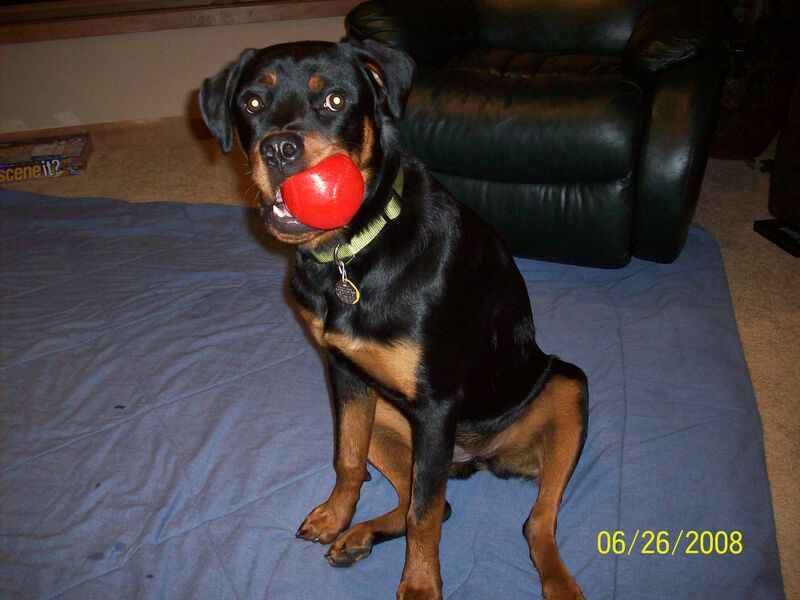 Rory's first love are his tennis balls, basketballs, softballs, soccer balls -- any round rubber item will do!! He carries one wherever he goes outside, sleeps with one in his crate, sits on the larger ones, and gathers them all in one place when he lays down outside. When asked to get his ball, one never knows which one he will pick! 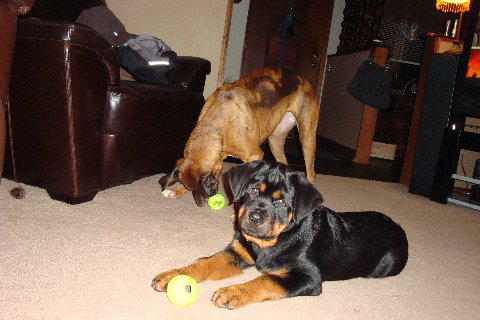 Second to his ball collection, are his "big girls"...he has really bonded with each of them, and loves to play with them (Gerda puts up with it nicely)! He and Nica can really get going, and they love to play "chase", especially around my fenced-in garden...they can reach pretty high speeds! Rory also loves going for ice cream -- he sits in the front seat, while his big girls sit in the back seat of the truck, and he loves his head out the window in town. He is a great watchdog, and sees a vehicle coming down road over mile away. He weighs right about 105 lbs, and is doing great. We also care for very sick, abandoned, tiny puppies for our local Humane Society. I am home all the time, so provide medical and physical care. The "hospital crate" is in the kitchen. Our most recent patient was a 2 1/2 week old yellow lab puppy, found beside the river in a campground. He had a massive infection, skin abcesses, etc. and etc. He was not expected to survive, but indeed he did! 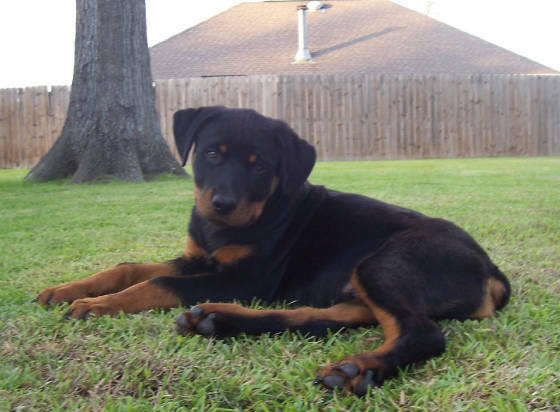 During the 3 months this little guy was with us, these giant Rottweilers would lay by his crate, or sit by us if we were holding the pup, or bathing him, and expressed much concern when he was getting his many medications, feedings etc. They were the most impressive supporters you can imagine!!!!!!!!!!! The pup was so incredibly tiny, and they are so big. Nica especially spent much time beside the crate, while Rory seemed to be the cheering section! Gerda stopped by countless times a day to check on things...amazing dogs they are!!!! Ona, none of these dogs would be what they are without your care, and devotion, prior to them coming to us. They each are excellent examples of all the effort and work and LOVE you put into them. 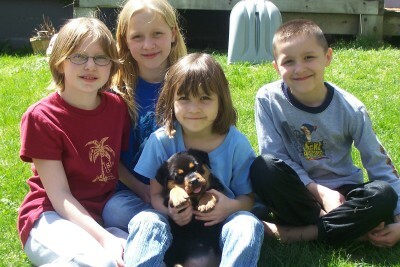 They are loving, stable puppies, who only have known goodness and kindness in their early lives. 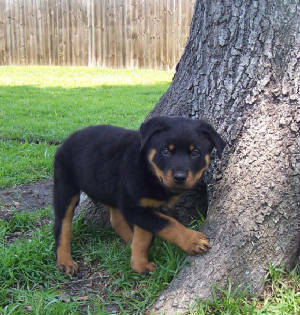 We simply cannot imagine looking anywhere else for a Rottweiler puppy. You have been so good to us as well, and we so value your friendship. Please know that we continue your love and care of these three special dogs in our home, and that they receive the best we have to give! Please stay in touch...we love the news you share, and its been fun watching your boys grow up, and how your dogs share in your lives. 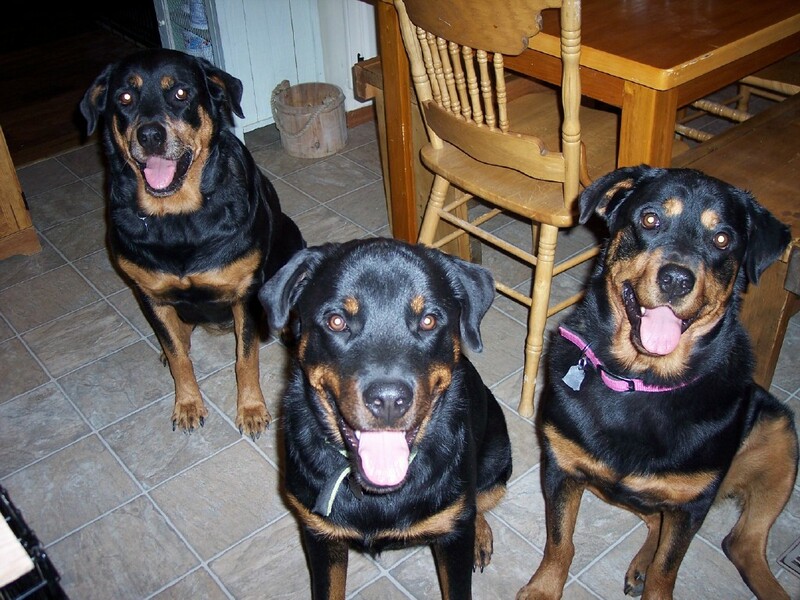 Know you are always in our prayers, and in our hearts...God bless you for sharing your beloved Rottweilers with us!!!!!!!! GERDA, RORY & NICA !!! 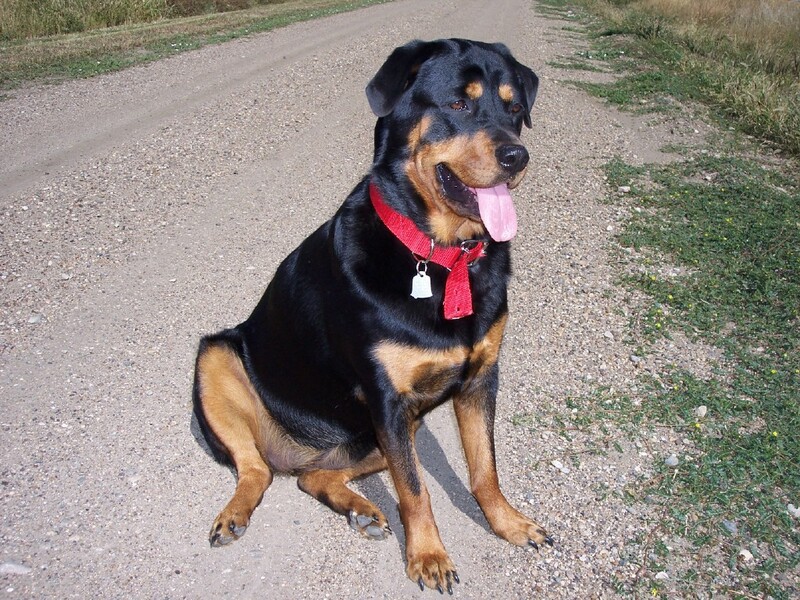 WE WERE SO EXCITED TO GET THE PRIVILEDGE TO GO OUT AND VISIT LISA & DOUG ALONG WITH THEIR FURRY FAMILY MEMBERS "GUNNAR"(ROTTWEILER) & "KIRBY"(YELLOW LAB) IN BISMARCK, ND YESTERDAY JULY 30, 2009 !!!. 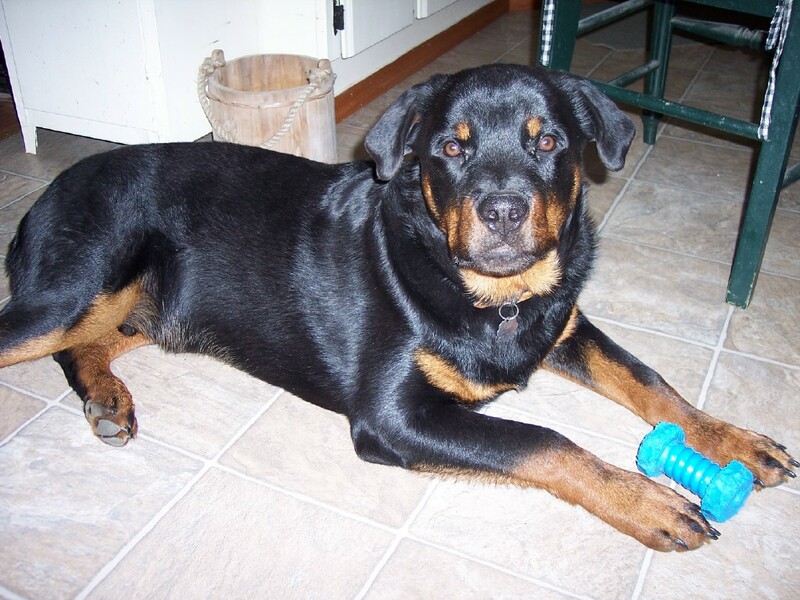 GUNNAR IS A MALE THEY ADOPTED FROM US OUT OF ANGUS & OUR LATE NIKKI. 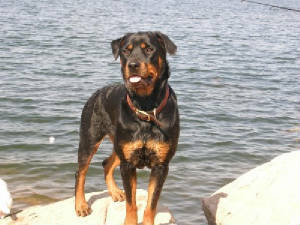 IT WAS AWESOME TO SEE HOW WELL HE IS DOING AND THAT HE HAS BLOSSOMED INTO SUCH A NICE DOG WITH SUCH A GREAT TEMPERAMENT. GUNNAR HAS RECEIVED THE RIGHT TO BE A THERAPY DOG AND IS WORKING ON EVENTUALLY DOING RALLY OBEDIENCE IN THE FUTURE. THANK YOU LISA & DOUG FOR TAKING THE TIME OUT OF YOUR BUSY DAY TO LET ME COME VISIT!!!! :) YOU GUYS ARE DOING A WONDERFUL JOB WITH GUNNAR. AND THANK YOU FOR ALWAYS KEEPING US UP TO DATE ON HOW YOUR WHOLE FAMILY IS DOING. Congrats on graduation from college! I think that your website is awesome. 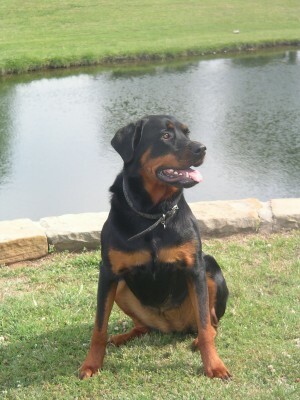 I almost started crying when I seen your rottie cemetary! 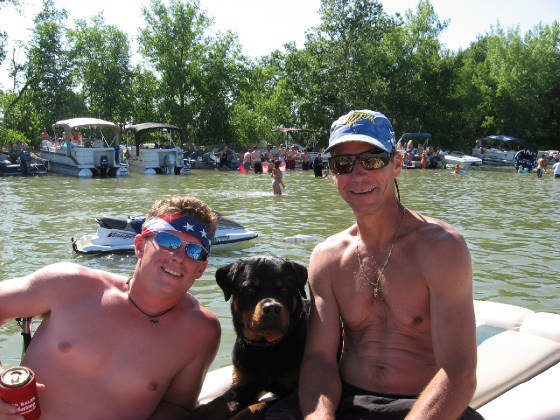 Gunnar has been doing OK. We were involved in a serious truck accident the weekend before July 4. We were vacationing in the Blackhills of SD pulling our "26ft Toyhauler" camper with my 1/2 ton pickup. Both motorcycles were loaded in back of the toyhauler. Doug was driving, we hit a strong gust of wind, & lost control & fishtailed with the camper. The truck flipped onto the passenger side & then onto the roof---totally crushing the cab. Doug & I were hanging from our seat belts upside down. (I was drinking red juice & spilled it so that it looked like blood). The first thing I did was check to see if I could move my arms & legs (it's a nurse thing). Then I asked Doug "WHERE'S GUNNAR?" We had to crawl out the driver window cuz the cab was crushed. Gunnar took off & was walking up to the stopped cars along the interstate, probably to get help for us...who knows. I had to coax Kirby out of the truck. Luckily both dogs are fine, except for the spilled juice that looked like blood. I begged & they wouldnt take Gunnar in the ambulance. One of the cops took our dogs to his personal vet to get them checked for internal injuries. Of course they wouldnt bring them to the hospital....we had to get them at the pound in Sturgis. Poor boys! Pickup, camper were total loss. Motorcycles are in the shop for the rest of the summer. Highway patrol said that it was the worst accident that they had seen where people actually lived & walked away. Doug & I had some cuts & sore backs. I took Gunnar to see my chiropractor with me afterwards...she even did acupuncture on him. He has been very "clingy" since the wreck. Our friends traveled 5 hrs to get us home & Gunnar just cuddled with Doug all of the way home. Thankfully we are all safe. OK, & this is really weird...the accident happened 10 miles from where my mom is burried, (I think that she was our saving angel) It has been a stressful summer for us. Pickup & camper have been replaced, so we have been camping with the dogs every weekend. I must get back to work, hope all is going well for you! WE WANT TO TAKE THIS MOMENT TO SAY THAT WE ARE SO GRATEFUL THAT LISA & DOUG AND THEIR DOGS MADE IT OUT OF THIS ACCIDENT ALIVE AND DOING GOOD. Just wanted to update you on Leo. He is now 15 weeks old and 32 pounds. We just started obedience class and we are on our way to becoming an AKC STAR puppy. Leo is such a good boy and very loyal. He is completely house trained and knows many commands. 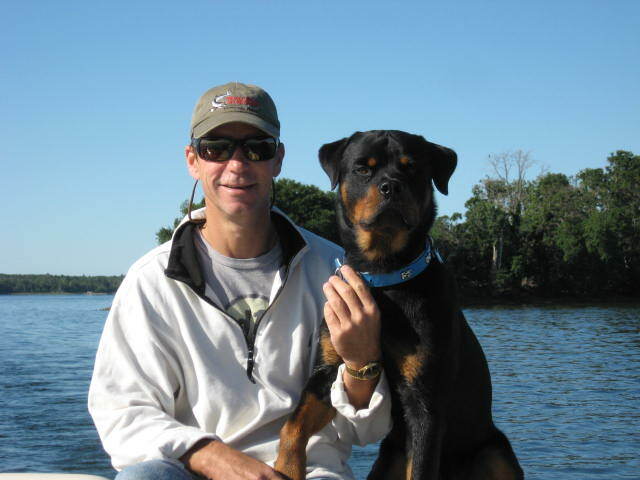 Our future goal with Leo is to continue in Schutzhund training. We have a wonderful AKC instructor that is helping us and that competes with her german shepherds. We will keep you posted on our progress. For now, here are two pictures of Leo at 15 weeks old. 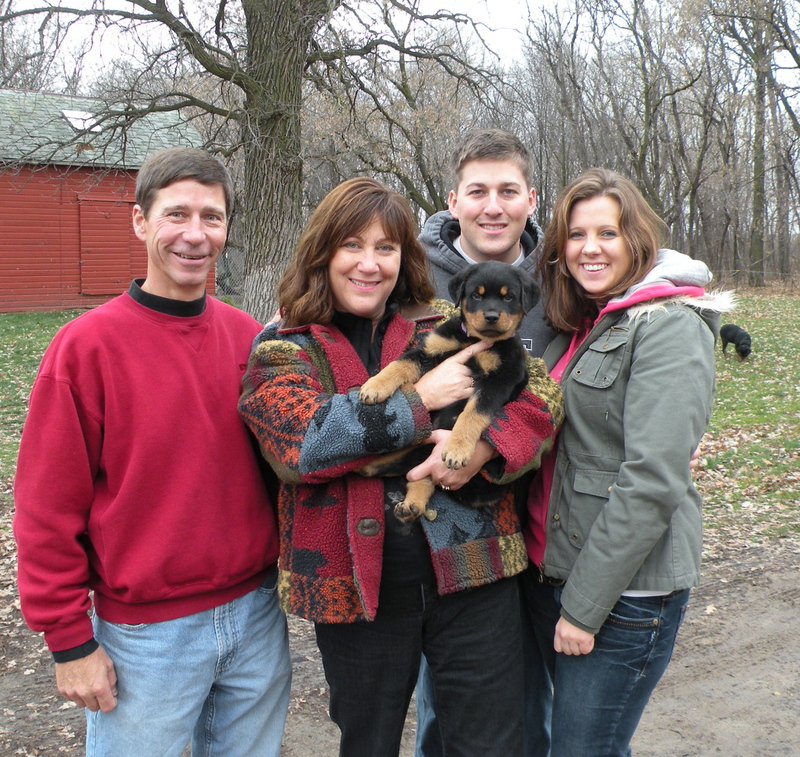 THANK YOU SO MUCH TO STEVE & JULIE FOR COMING TO OUR HOME AND SEEING OUR ROTTIES AND VISITING . IT WAS SO NICE TO FINALLY MEET YOU AND TO MEET YOUR OTHER DOG NAMED "MIA". SHE WAS A VERY NICE GIRL AND WAS A SWEET HEART!!!! WE KNOW THAT THIS NEW BOY YOU PURCHASED WILL BE IN GREAT HANDS AND DO WELL. IT WAS ALSO FUN TO WATCH HOW MIA ADJUSTED TO YOUR NEW FAMILY MEMBER. 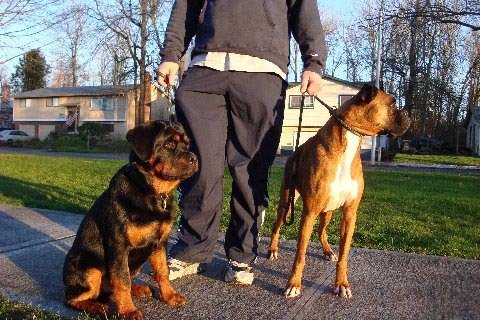 ONE OF THE PICTURES BELOW ARE OF "LITTLE BOY" LEADING "MIA" AROUND BY HER LEASH. IT WAS SO CUTE WE COULDN'T RESIST TAKING THE PICTURE. 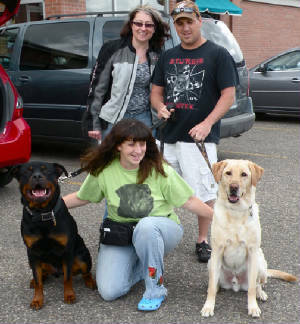 AND THE OTHER PICTURE IS OF STEVE & JULIE WITH THEIR 2 DOGS. 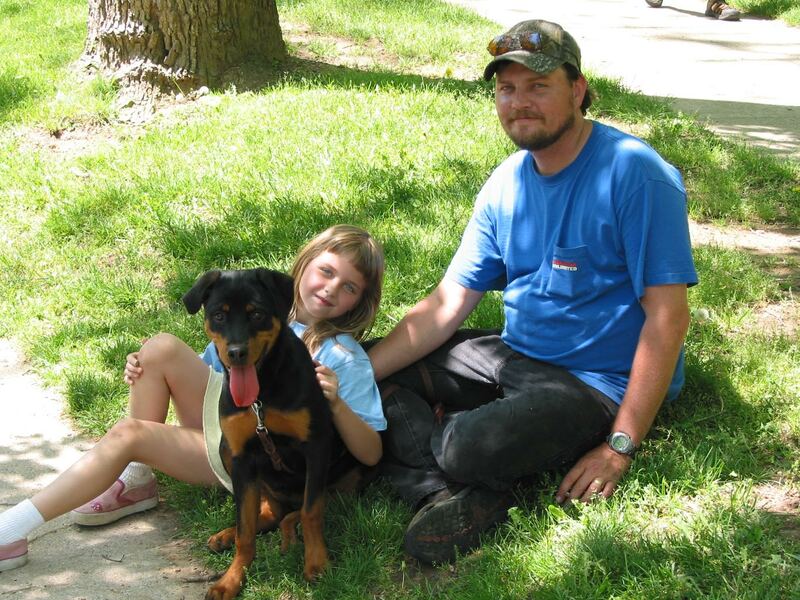 STEVE & JULIE / HAPPY NEW OWNERS !!!!! WRITTEN: JULY 9, 2009 !!!! 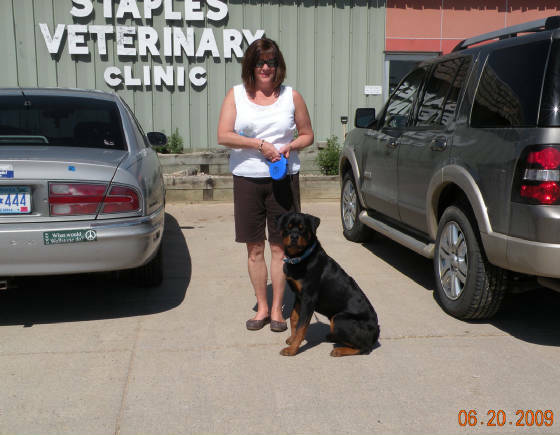 I am so glad you decided to use my Vet Kathy Marcussen (Staples veterinary Clinic) for "Victor's" neutering surgery. He was in GREAT hands and we seen that in the job WELL DONE after his surgery too. Victor is such a gorgeous male and is so very loved by his family. He is in such caring hands and wonderful people. Thank you for letting me be a part of Victor's life since you brought him home. Just writing to give you an update on Tank and some pictures. He is doing great... still working at potty training but he is getting there. Overall, he is a very calm dog and is great with our family. Lately he has gotten a little "its all about me" attitude but I'm sure that it is just his age. He graduated puppy kindergarden last week and will be starting obedience at the end of the summer! We are taking him up to my cabin for the first time this summer so it will be funny to see how he reacts to the water... Im wondering if he will love it or hate it? Im excited to see that you have a sale pending on the last pup! I hope it goes through! Just wanted to let you know how things have been going since we have had our new addition to the family. It has been a week since we have had Leo home, and he is doing great!! It seems like he has adjusted very well. The only issue we had at first was with socialization. He didn't like to be handled all that much, he would growl and bite if he was picked up. You know what though, after a few days of constant interaction with people, he is alot more relaxed and has realized he is not the boss. We go everywhere together, he loves to ride in the car. 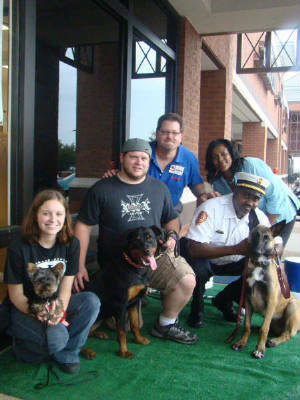 Our goal is to meet as many new friends as possible, two and four legged, to be well socialized. Other than that, Leo is very smart. We have already learned how to walk on a leash, sit, and he will sleep all night in the crate without any problems, even with no accidents!! He is definitly taking to crate training, I catch him snoozing in it in the middle of the day, even though he is able to roam where ever he wants. He also likes to collect all the toys from around the house and stuff them in the crate for later so Zeus doesn't take them. 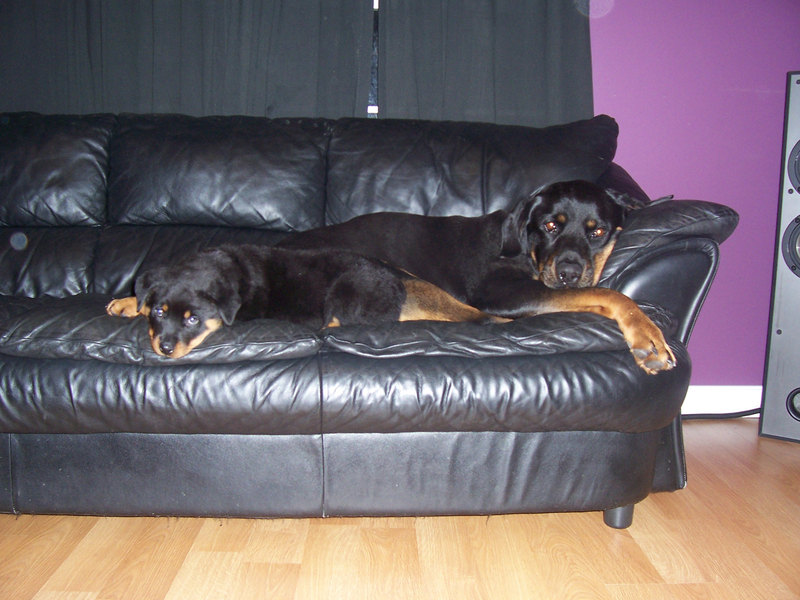 I have attached a couple of pics of Zeus and Leo on their couch, (yes they have their own couch) and a couple from outside. I will keep you updated as he gets older to let you know how we are progressing. Thanks for such a wonderful baby! His vet check went great, at 8 weeks he was 16 lbs and very healthy!!!! "LEO" was not a puppy raised in our home. 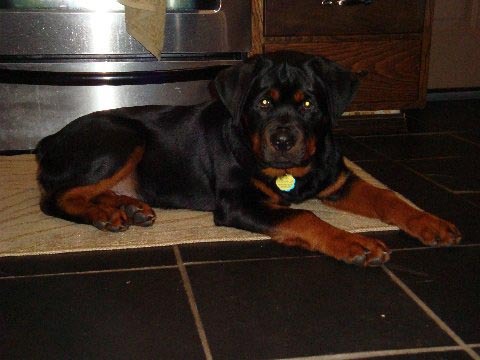 He was raised at another breeders home who's female was bred by our "ANGUS". ANGUS X NIKKI FEMALE PUPPY !!!!!! my family as well as my Victor! Gunnar is still doing awesome. Last nite we did pet therapy at the hospital. There was this man on the rehab floor who had experienced a cardiac arrest last week & his heart quit beating for 20 min. The family was in the room with him & he couldnt talk. We brought our therapy dogs (Gunnar & Loki the Bichon). I guess he was a farmer & loved dogs. I brought Gunnar to his bedside & took the patients hand & began petting Gunnar, we also placed Loki beside him on the bed & the family was using his hand to pet Loki. The family really enjoyed our dogs. After we left the room, we heard the family cheering...The daughter comes running down the hall after us. I guess they asked him if he enjoyed the dogs & he said "yup" which was his first word after his cardiac arrest. We were in the waiting room showing our dogs to other people, when the daughter came running up to us again...the patient talked again & said "I have to go pee!" I had tears in my eyes....that is so awesome. Hopefully this patient will keep improving. I think our dogs brought him out of a slump. One of our nurse coordinators is planning on doing an article on me & Gunnar volunteering for pet therapy. It has always been my dream to own a therapy dog to visit hospitals & ill people. 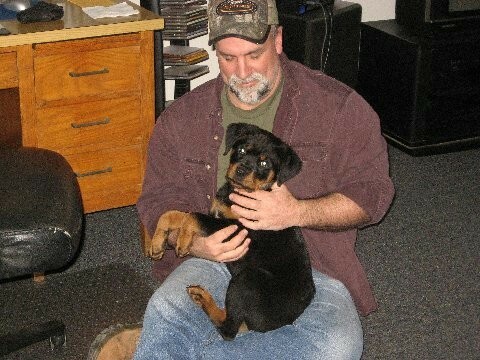 Gunnar has grown, he now weighs 114 lbs, he is starting Rally Class tonite. I'm excited to learn rally, this will be a new experience for us. I will send more pics soon & keep you posted on our progress. Just a few more pictures of Storm. He is an outstanding dog, with the best temperment. He is slowly getting potty trained - much quicker than dogs we have had in the psat. We absolutely adore him. He is growing like a big weed. He plays well with the kids, and I have been trying to socialize him daily. Thanks again for the high quality dog that you have bred - something to be proud of. Hi Ona -- just a quick note to wish you and your family a most holy and blessed Easter!!! You are always in our prayers. Know you are so busy, and I bet counting the days till school is done! We are still having winter here, snow for today. Rory is doing wonderful!!!!! 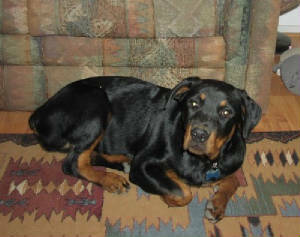 He remains very snuggly and cuddly, loves to play outside, does his commands beautifully, and we just love him!! He and Nica do well together, and Gerda just observes his antics, and takes a nap! Some days I know exactly how she feels...I will get off a new photo in the next few days. 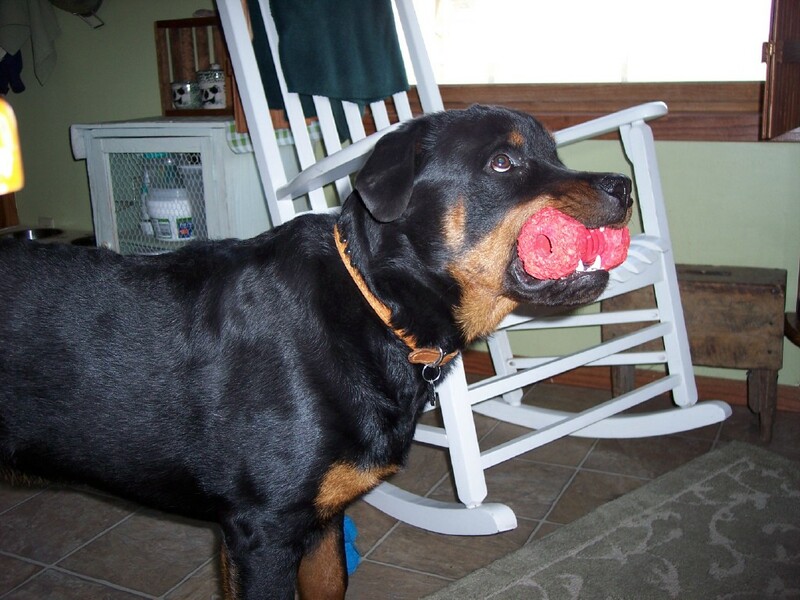 Rory is very dark and handsome, very stocky, and adores his football and running with it!!! 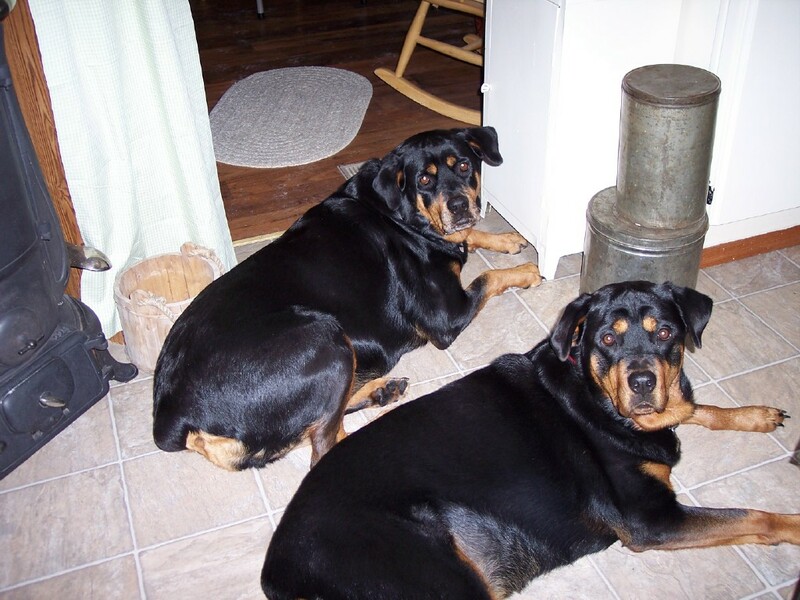 Thank you again for our absolutely super Rotties!!!! nurses took pics. He was very well behaved...he balkeda little the first time he seen an IV pump on a pole, butthen he was fine. height to see patients in bed. I heard really good news last nite...my instructor said that she thought Gunnar is ready to start pet therapy at the hospital where I work. He is such a sweet dog. I'm in the process of starting his 10 volunteer hours (St. Alexius therapy dogs go through "Love on a Leash"). I'm excited to do this! I'm sending you some pics that Doug took last week. I hope all is going well for you, we keep checking out your website cuz I like to hear about your dogs. One of the surgeons that I work with is possibly interested in one of your male puppies this spring. His name is Mike @@@@@@ & he may be calling you. I will keep you updated on Gunnar's progress! thanks for all of your advice & support! 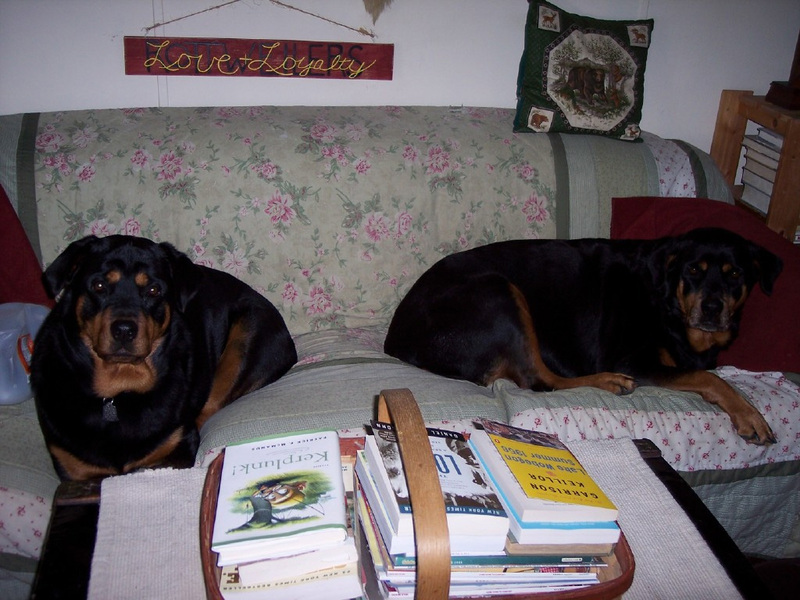 were two Rotti's there that were therapy dogs-- Aries (boy) and Jade (girl). outdoors and hops thru the snow. It is so cute. Love to your family and may GOD bless you with all his best this winter. Your website is awesome! I cant get your video of the "rottis playing" to work...what program do I need to use? It's soooo hard to believe that Gunnar will be 1 year old in a few weeks. It's so hard to believe that he rode home from your house sitting in my lap! He still tries to climb in the front seat of my truck to sit on my lap. He is now 110 lbs & doing great. 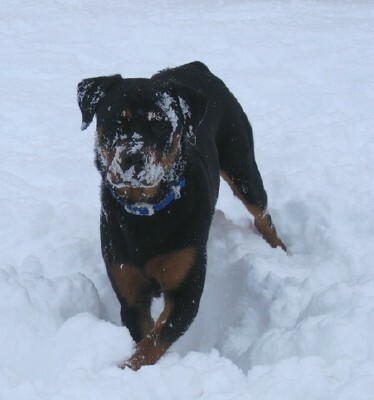 There is alot of snow here in Bismarck & he loves playing in it. 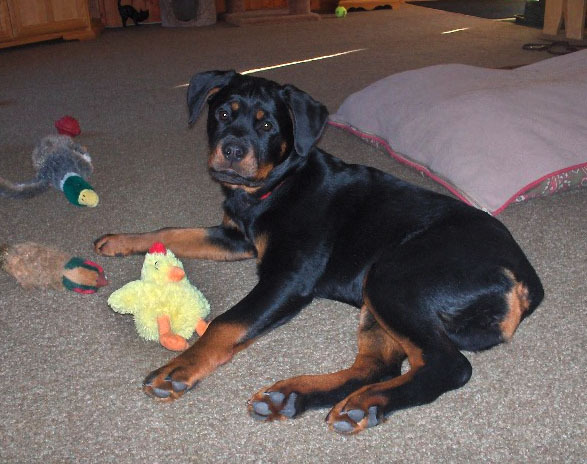 We are still going to obedience class because he has fun & enjoys the socialization. He cries when we drive by the building where we have class. I will keep you updated on his progress & promise to send more pics. I hope all is going well! I just wanted to update you on how great Gunnar is doing. He is now 10 months old & weighs 103 lbs. I have received many compliments on his gentle disposition. I am proud to announce that he passed the AKC Canine Good Citizenship Test a few weeks ago. He is well on his way to becoming a therapy dog. There is never a dull moment at my house with the 4 animals. Gunnar had no problems adapting to my other animals. He has a blast playing with our other dog & it is so funny watching him play with the cats--- I think he remembers your Yorkie, because he really wants to play whenever he sees little dogs similar to that breed. Gunnar also has an obsession with dish towels. He will grab them off the kitchen counter & trot around the house with them. 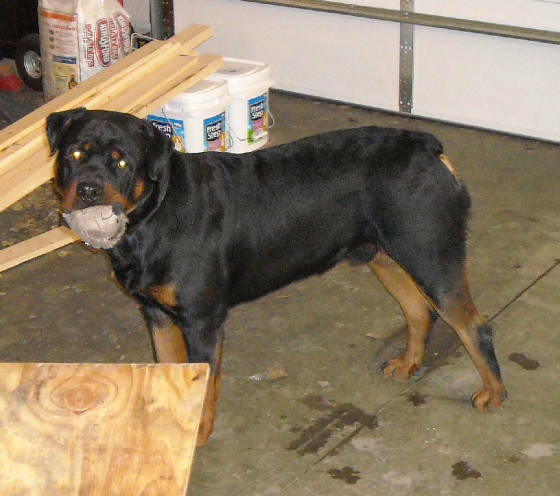 It is funny watching the silly rottie expression on his face. We also keep our laundry covered because he enjoys bringing out dirty clothing whenever we have visitors. He is such a clown! 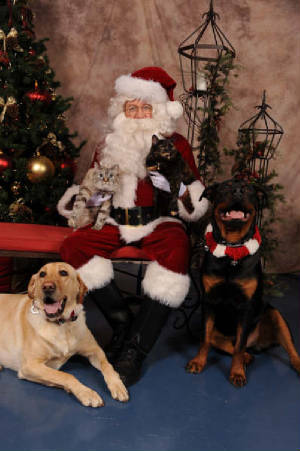 I'm sending you pics of my animals with Santa. We really enjoy having Gunnar in our family. I hope you & your family have a Happy Holiday season! I will keep you posted on Gunnar's progress! Just want to send a quick note to give you a one year update on Lexi. First of all Thank you for a wonderful addition to our family. Lexi is 100 pounds as she approaches her one year birthday 12/18/08. She still has room to fill out in her neck and shoulders. She has been so much fun for the boys and I. She has such a great personality, loves to have fun! she is awesome with the kids, (she is their best friend). She is strong, loving, fun, playfull, always Keeps us amused! She loves being around me and the boys. One funny thing... when you talk to her she looks in your eyes... pretty cool! We want to say a special "THANK YOU" to John & Ginny, proud new owners of "Victor", for giving him such a wonderful loving home. We are excited to have met such a wonderful family and we can keep in close touch with them as they only live about 2 hours from us. It is always exciting to see our precious babies grow. 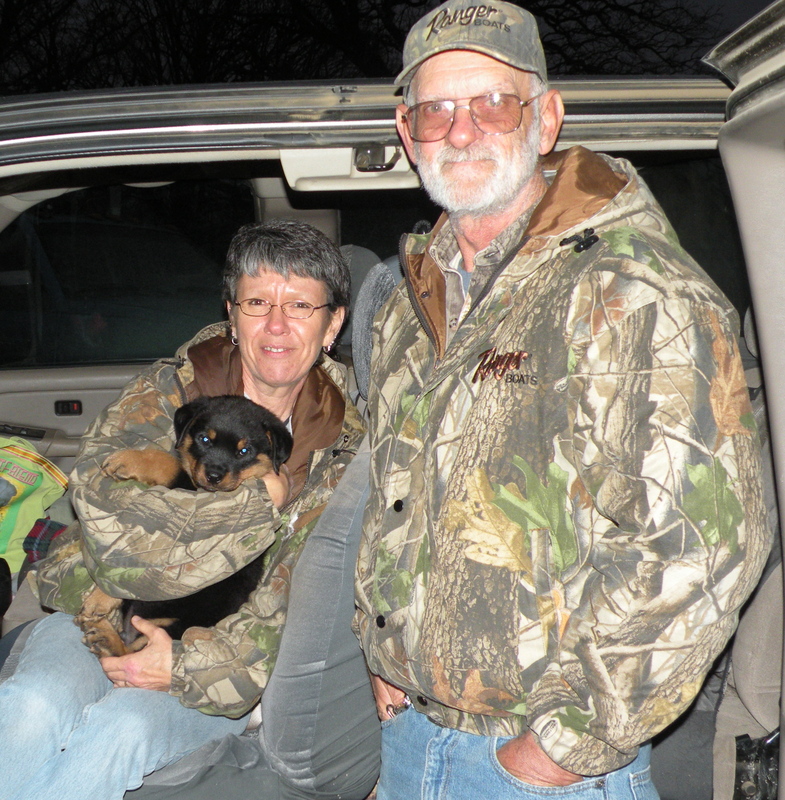 Larry & Catherine Johns of South Dakota are the proud new owners of “RORY”. This is now the 3rd puppy they have bought from us. And we are so blessed to have met them. Their 2 other dogs are females and they are now 3 & 5 yrs old. THANK YOU so much for giving our puppies such a wonderful home to live in. There are other pictures further down of the females they have, their names are Nica 3 yrs old & Gerda 5 yrs old. I hope this email is still correct for you. 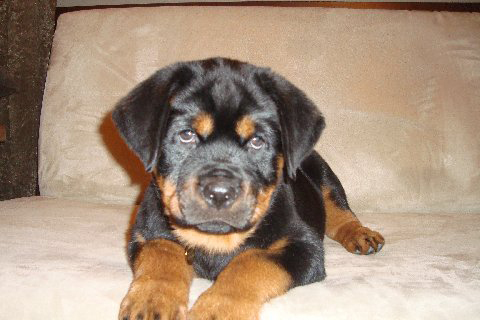 I got a Rottweiler from you 5 years ago. He was 4 months old and we met in St. Cloud so I could adopt him from you. I named him 'Lucky Boy.' We call him Lucky. I just wanted to let you know that he has been a CGC dog for a couple of years and passed his Therapy Dog test a couple of months ago. He loves kids. We volunteer with Arottalove. 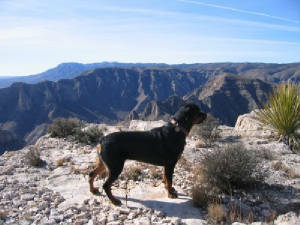 Lucky has become an ambassador of the breed and the organization. We go to many schools teaching young school children Dog Bite Prevention and how to be safe around any dog. All the kids get to pet him at the end of our presentation. My husband teaches the class. We do many events for Arottalove, we will be at the Renaissance Festival on Sunday with Lucky. He was an only dog for a year, then I got Jack, a cat. Who acts like a dog. 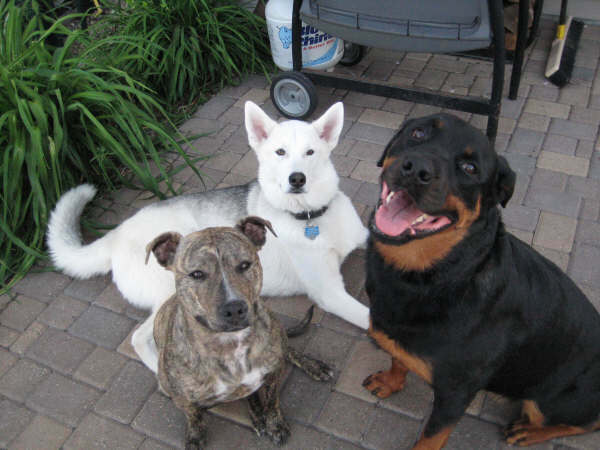 Then I got married and now we have Lucky, Tug-a rescued Husky, and Sheba-a rescued brindle Pitbull and two cats. And a human baby. I just wanted to let you know what a great dog he is. I love Lucky more than anything. I just wanted to let you know how wonderful of a dog he is. I attached a couple of photos also. Thanks for breeding such exceptional dogs! Gunnar is doing great. Today I took him to the art fair at the Capital Grounds to be around people. I received many compliments about how beautiful & well behaved he is. He walked through the crowds well & sat like a gentleman while people petted him. I think that he enjoys entertaining people, he is kind of a clown at home. I bought him this "giggle ball" that makes goofy noises when it bounces, it is hilarious watching him play. He had a female admirer trying to flirt with him today. There was a little dog like your yorkie terrier who just kept looking back at him. I started laughing & the terrier's mom slowly walked up to us & said that her dog doesn't like many other dogs. Gunnar & the little terrier were smooching & acting like buddies. I think he still remembers your little terrier... Even when we walked away the terrier kept staring at him. I think she had the "hots" for Gunnar. He is so gentle with other animals. This last week we had a really bad thunderstorm & Gunnar became scared & cried, so Doug & I took turns cuddling with him in our bed. He is very good in the house & has not destroyed anything except toilet paper rolls. He will grab them from the bathroom & run with a smirk on his face. The Kong wubba toy lasted about a week cuz I fell asleep & forgot to take it away from him. At least he was chewing on his toy instead of a pair of my shoes. Thats ok, the world kept turning. I am in the process from switching him to adult food, the nurti source brand that you use. He is tolerating it well. I will keep sending you pics, I think he avoids the camera on purpose. Today I took him in the petstore & he weighs 77 lbs. 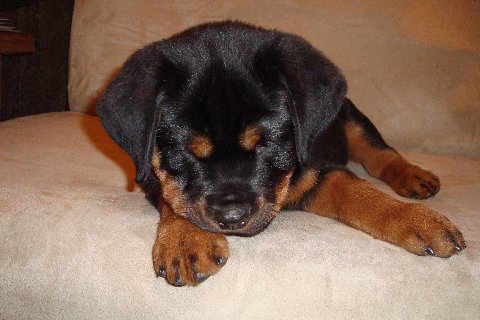 We are so happy with our Rottie. 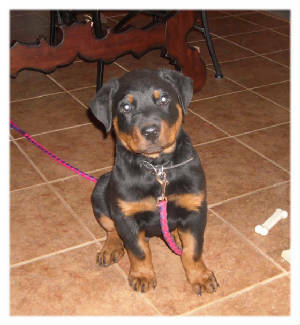 I will try & get pics of him in obedience class. He finished the first 2 obedience classes but we are going to keep going. Betsy is splitting her Basic obedience class into two groups & adding more advanced stuff. We are going to keep going every Monday. Is Gunnar too young to start agility classes in the Fall? I really dont want to overdue it with his joints but he really enjoys playing on the equipment in class. I think it would be a fun challenge for him, especially when the weather starts to get crappy & we cant play outside. Well, I must be going...I promise to send more updates & eventually some good pics. Please let me know if there is ever anything that I can do for you... feel free to use my pictures & updates on your website. I just wanted to update you on Lucy. I can't believe she is over 8 months old already. She is the most amazing, lovable dog. She has won the hearts of all our neighbors. We could not have asked for a better behaved dog. She is a wonderful part of our family and goes with us everywhere. 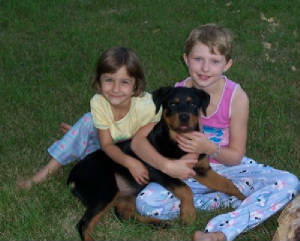 Our Girls Rachel (9) and Megan (8) are thrilled and play with her constantly and walk her many times every day. 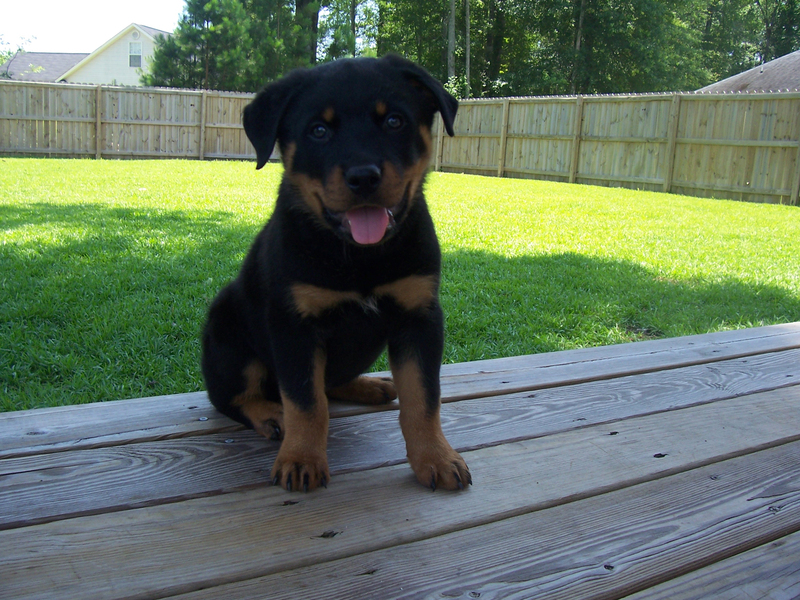 I can't get over how expressive rotties are. She has so much personality - she is actually very hilarious. She makes us smile all day long. Plus, she has the best smile. 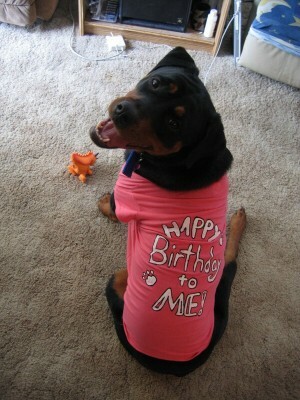 We can't thank you enough for breading such amazing Rotties. Attached are a few new pictures of Lucy. Here are some pictures of Sasha. There are some from her first bath, through Christmas right up to last weekend at the cabin. We just love her so much, we are so happy with her. She is such a good dog, and so social. We just completed her puppy training classes and are currently are taking her to the next (intermediate) level of classes. She is so much fun, and we just enjoy her so much. I really can't say enough about how happy we are that Sasha is in our life now!! Thank you so much. 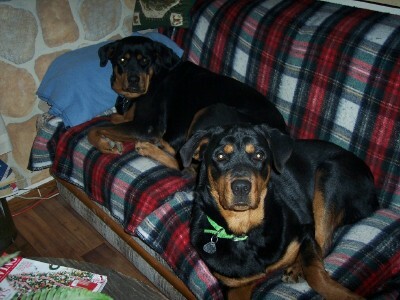 Kallie & Karmen are his Rottweiler family that Koda lives with! I thought you would like to see a picture of Koda. He is doing very well and is so smart! He graduates from intermediate obedience this Monday and I am going on to advanced obedience with him. The instructor in the class uses him to demonsrate things to the other people because he picks things up so fast. She always says "come on handsome lets go". Thank you so much for giving us such a wonderful dog!! Just want to say thanks for everything. 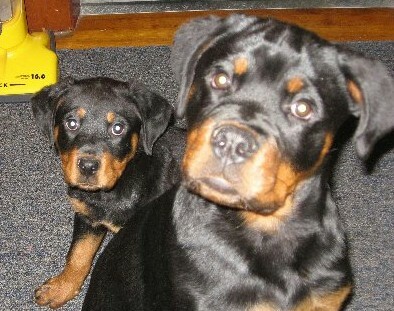 Yourself and Randi deserve a pat on the back for raising such beautiful rottweiler puppies. Here are a few pictures, he(Dakota) is growing so fast. 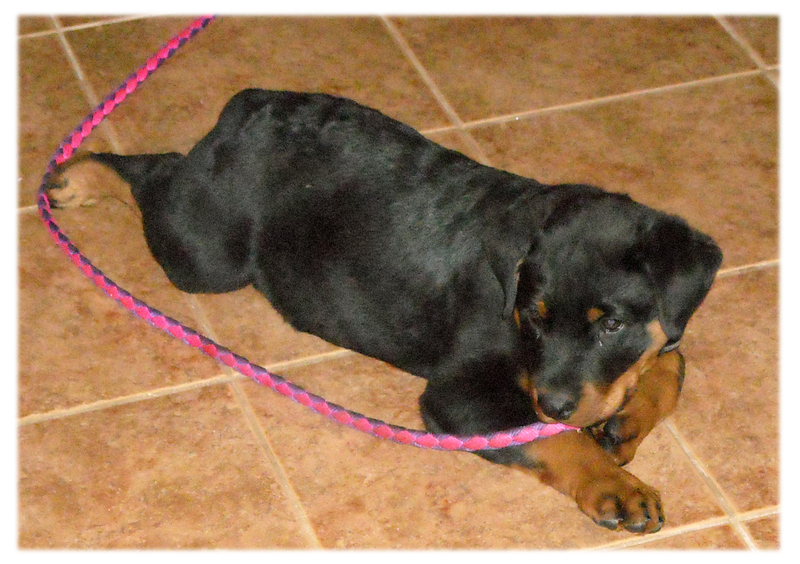 Mandie is a female puppy out of Randis Rotts Kennel. 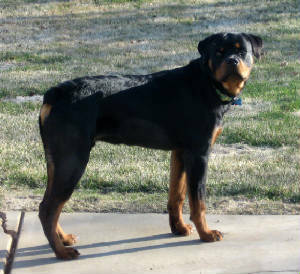 Dakota is a male puppy out of our Sire "UCI INT CH Thundervly's Falco Von Dillon" & Randis Rotts Dam "Windsongs Poco Vom Rothom"
forward to working on her title's. I will let you know how she does. Thank you so much to the Hasting's family in Wyoming, MN for providing such a wonderful loving environment for one of our precious pups. The Hastings run their own family business and so their new pup "Harley" will be getting much soclialization. Here is the website for their business www.pinehavenfarm.com We were able to go visit "Harley" in his new home on April 4th, 2007 and he is a very nice looking pup and is very healthy and sweet. Harley is so smart that when he has to go potty he goes to the door and paws one of his feet in the air to let them know he has to go. The Hastings told me that Harley has been one of the smartest dogs they have ever raised. Caillou & Jessie Pup born Nov 14, 2006 !! Hi Ona thought I would send you a quick message and some pictures of Icey. We had a birthday party for her and this is her new birthday outfit. And the others are of her playing in the snow after the last storm. She is doing GREAT. She has been spending time with the trainer in Alexandria and is proving to be a hard worker and very eager to please. I cant thank you enough for all you have given to our family. Feel free to use the note or any part of it and the pictures on your page. Hi Ona ...We were so very happy to get your note!! I can't begin to know how you manage everything, but I sure do understand about dogs and puppies -- they really are excellent tranquilizers, aren't they!! No matter what stress and tension we may have in our lives, they have the ability to slow us, and our blood pressure down! I just cannot thank you enough for picking the male puppy you feel would really work into our family!! With you watching how they and their personalities develop, you have so much insight into each one. In fact, your picking Nica, and saying you thought she would be good -- we could not have made a better choice...she is such a character, a clown, a snuggler...the facial expressions and eye contact she makes is so varied, and we think she loves making us laugh. She has a number of "games" she has made up, and when she can get us to cooperate, she is overjoyed!!! She also does what we call "fancy paw stuff" -- she does all these paw gestures, very detailed movements, its incredible!! She also loves to dig in the toy box, that is so comical in itself...especially if she finds a new toy! And our Baby Gerda...what a girl! She is so tolerant of Nica's doings, shares the couch and bed with Nica no problem, washes Nica's ears EVERY morning, loves to go for rides, and knows exactly where her Beach is for water fun. She is so steady, and seems to be great with the other animals here, her chickens, and the kitties. Gerda has a more mature, serious nature, but at times can be so silly!! Can you tell we love these girls??! We have the new crate all ready for this dandy boy, and look forward to having him join our family! Thank you so much for writing, and we are really looking forward to the photos of him and everyone!!!! Please take good care of yourself...you remain always in our prayers!!!!! E-MAIL RECEIVED ON: AUGUST 18, 2008 !! Hi Ona...how are things with the ending of summer and the start of school? Hope you are all ready, and the boys too! Larry and I have done alot of talking and thinking about this for ages...we would definately like to get a puppy of Dillon and Sweet Pea's litter due in Sept. We have felt a male we would neuter would fit best with the girls, pet quality, not for showing or breeding. Could you let us know when the puppies are born, and if there is an available male, we would immediately send you a deposit. 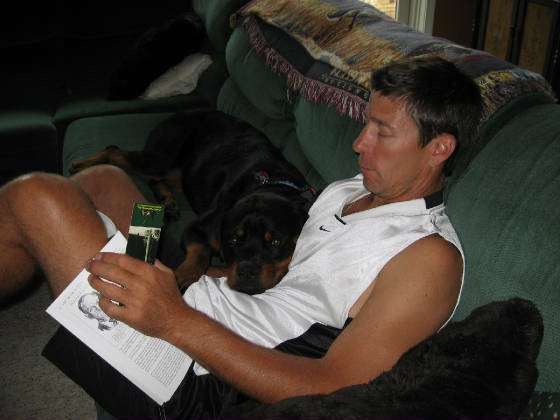 We think it is important that ALL our Rotties come from you, and we know and trust you. We just love how Gerda and Nica have responded to us, and bonded so deeply to our family...not possible without the great care you provide!!!!! Please let us know if you think a male pet quality puppy would be available for us...we are so looking forward to hearing from you!!!!!!!!!! TAKING A GOOD SNOOZE !! Just a note to let you know we think your photos are great -- and we absolutely love the looks of Dillon!! Please do keep us updated on future litters of his! And of course, congratulations on your showing...wish we were closer to be present. 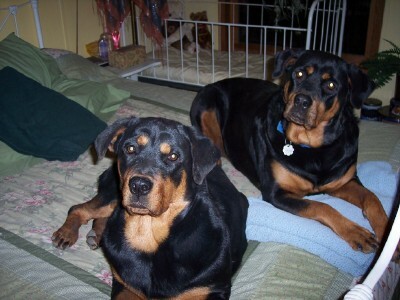 You do a fantastic job with the Rotties! My heart goes out to you placing your dogs in new homes...I try to think how you must feel, yet being on the receiving end would be wonderful -- what a tremendous gift you have given families!!! I know how much Gerda and Nica mean to us, and how much better and complete our lives are because they are with us -- and all because of you!!!!!! You have given a rare gift to people...and you hold such a special place in all our hearts!!!!!!! Hope you are feeling well, and looking forward to Christmas...it is such a time of joy and new birth. You are always in our thoughts and prayers, and we are so grateful to know you. Please stay in touch, we check your excellant website on a weekly basis, and love keeping up with all that goes on for your family and the dogs!! 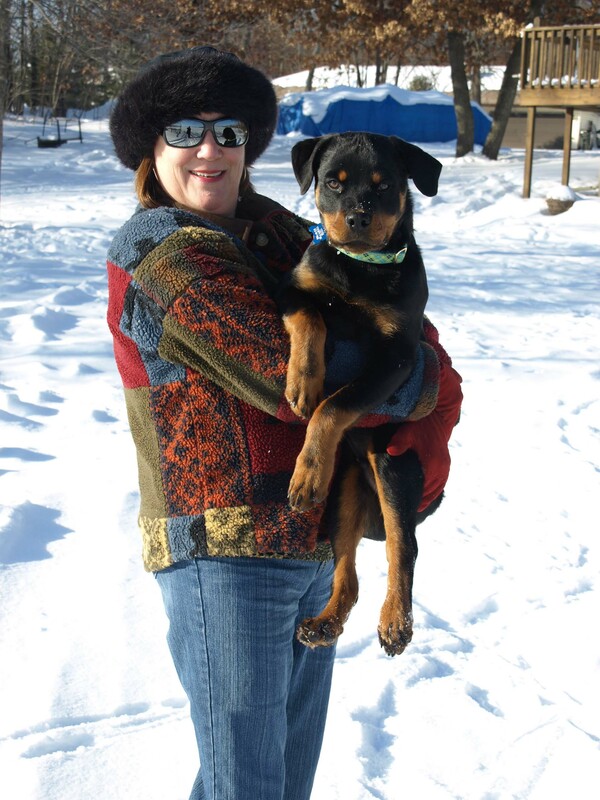 Pictured above is Catherine Johns of South Dakota and her new baby "Nica". Catherine has purchased a female from us before and she is listed below and her name is Gerda. 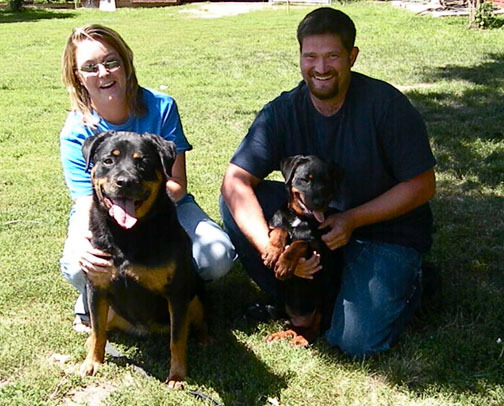 We are very thankful that Larry & Catherine were so pleased and wanted another addition to their Rottweiler family. Thank you & God bless ! ! Nica is doing beautifully! She now weighs 15 lbs, and seems to grow almost daily. She knows her name, is excellant with "sit", has never pooped indoors, and is doing well on her leash. She seems to like riding, and loves the outdoors! She has never fussed at nite, and likes the space of her own in her crate. She loves playing games, and has a good sense of humor we think! Elly doesn't pay much attention to Nica, but on occasion she "talks" to Nica -- and Nica just sasses her back!! The two kitties play "chase" for awhile, then leave the scene...Nica could play that game for hours! 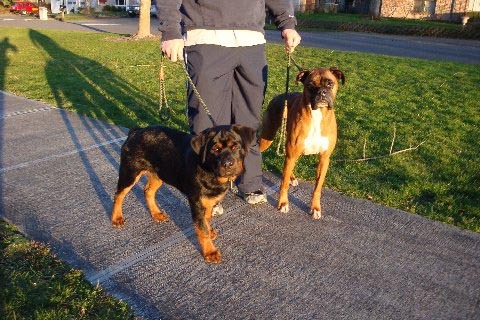 Gerda occasionally goes for walks with us, but since she is pretty rough, we never leave her and Nica alone together. Gerda doesn't realize the size difference, and wants to play with Nica the way she and Elly used to play...lots of pushing, etc. complete with sound effects. 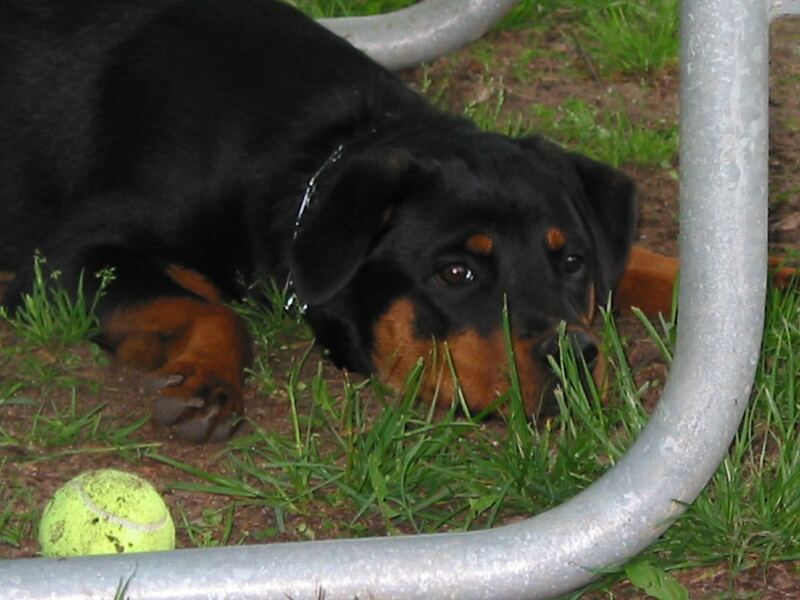 Nica has had a couple of "Rottie Temper Tantrums" over obeying the leash when walking, but nothing compared to Elly's "epic performances" as a puppy! Nica has been really good to work with, as was Gerda! Nica loves to please, and all her training is being done with PETS and PRAISE, which she really soaks up!! She still enjoys being cuddled, and wants to snuggle up against our necks...she is very loving and affectionate, as Gerda was when she was a puppy. If something comes along that Nica isn't sure of, she stands between our legs till she is reassured everything is okay. 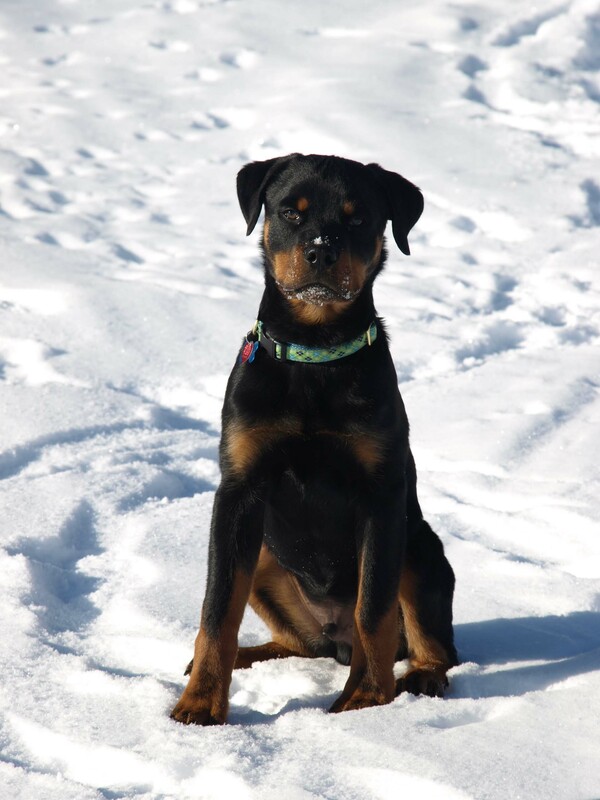 I am so happy we were able to get our Rottie from you, and happy Gerda came from you as well! They both are such good dogs!!!!!! Hope all is well with you -- your house must be pretty quiet right now!! I am sending some photos of Gerda (puppy from O'Riley Girl and Mad max - born June 1, 2003) and a little update on her life! From day one with Gerda, she has been a "giant smile"! She is the happiest dog I have ever known in my life. Gerda is now 2 1/2 years old, weighs well over 120 lbs. And looks absolutely beautiful! 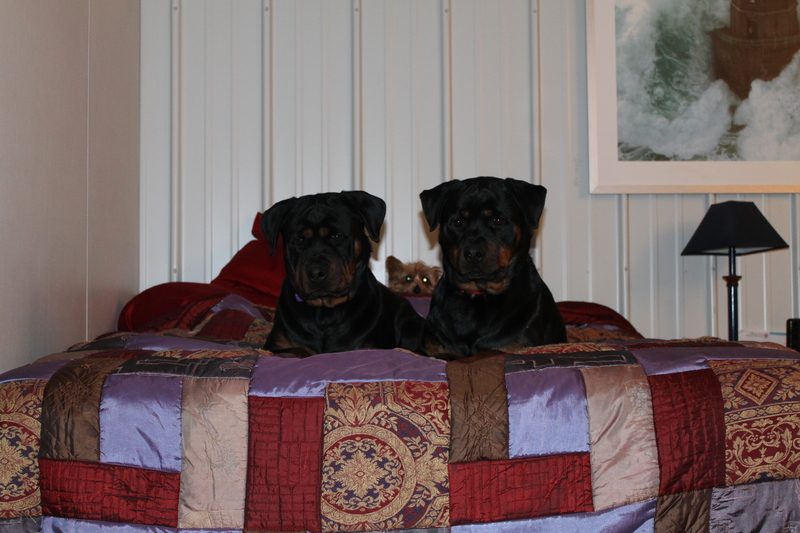 She is so bonded to our family, and to her Rottweiler housemate, nine year old Elly. Gerda has always shared our bed at night, and our couch the rest of the time. She adores snuggling up tight to her family members. She loves to be brushed and petted, and "purrs" in her Rotty voice. 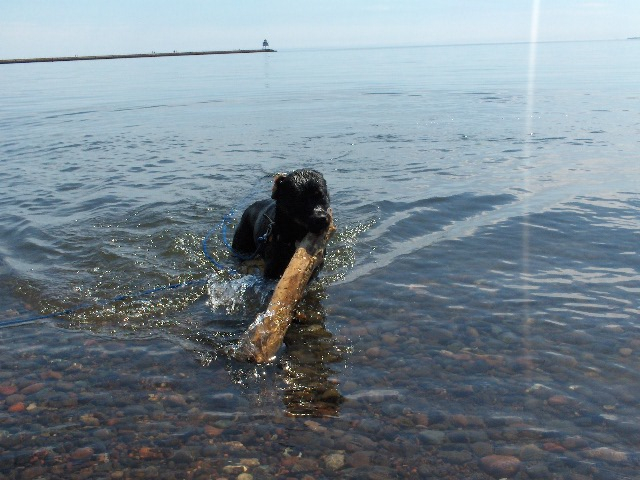 Gerda loves the water, and going for long walks off leash. She would never miss her 6 AM treat time each morning, and her internal clock is so timed. She loves to sleep on her back whenever a nap comes over her. She is very alert, and lets us know each time she hears an unfamiliar noise. She loves to jump and dance for the pasture cows, a real show-off! Every toy of Gerda's, be it indoor or outdoor, has a three foot soft rope attached to it -- which she manages to wrap around her nose, then runs her fastest with the toy flying out behind her. She has done this since puppyhood, and has never lost the "fun" of doing it! She can be so silly and is just a natural born clown...yet she is also full of concern and empathy for her housemate, and family members. Her eyes are so reflective of her great spirit. Gerda is goodness, and sunshine, and laughter, and we could not have made a better choice!!!!!! Thank you so much for letting her become our family member...she will always be so cherished and loved!!!!!! 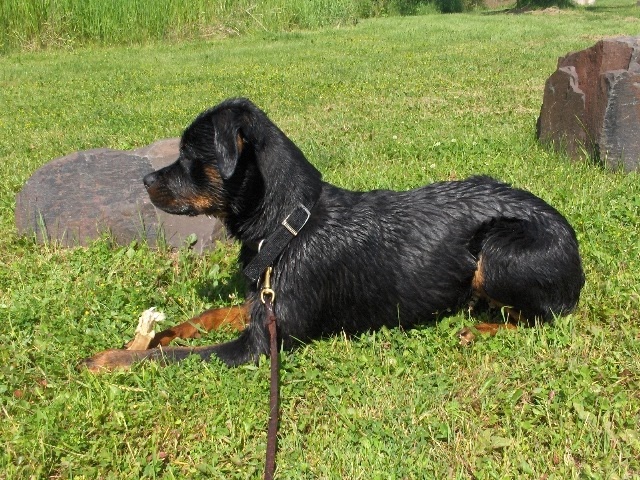 Our nine year old Rottie female, Gerda's friend Elly, is quite ill with Osteosarcoma, and does not have much time remaining with us. As her human family members care for her, Gerda can usually be found laying near Elly these days, head on her paws, offering compassion, loyalty, and untold moral support. Gerda offers the gentlest little kisses to Elly, and with them come underatanding beyond human bounds. I wish I possessed only half of Gerda's wonderful qualities...she is a friend and family member beyond description!!!! Again, our gratitude for our sweet baby girl! Here are some photos of Bluto, who I believe is six months old today. He is everything we had hoped for and so, SO much more. He is an unbelieveably alert and active clown who hasn't yet met a person, place or thing he hasn't liked and effortlessly crawls into the heart of everyone he meets. Although they are not inseperable, he and Banshee have become great playmates. 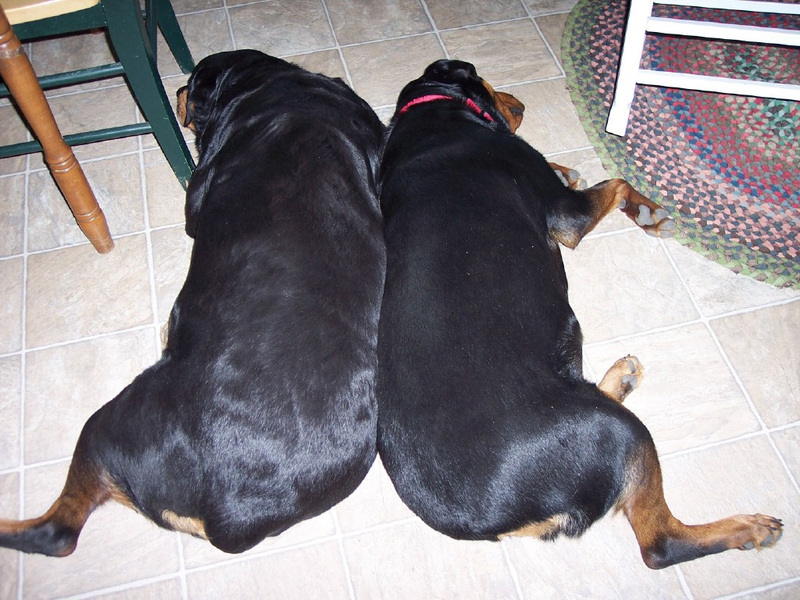 They give each other major work-outs daily (Bluto is usually... surprise!!!... 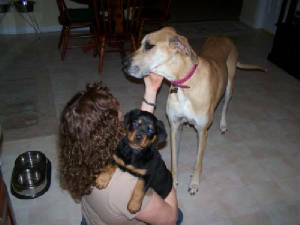 the instigator) and Banshee has been very sensitive to his size, giving him no more than he can take (or dishes out). 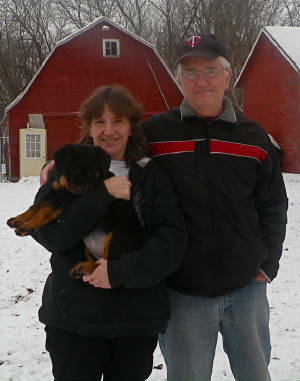 Thank you so much to Mark & Michelle Patterson of Pennsylvania for giving "Bluto" such a wonderful home. We know he will be well taken care of and loved dearly. And he will so love to have "Banshee" (Great Dane) as a friend to play with. Thank you Jason & Angela Arend of Frederick, SD. for adopting this wonderful male puppy now named "Bruce". We know he will be loved greatly. 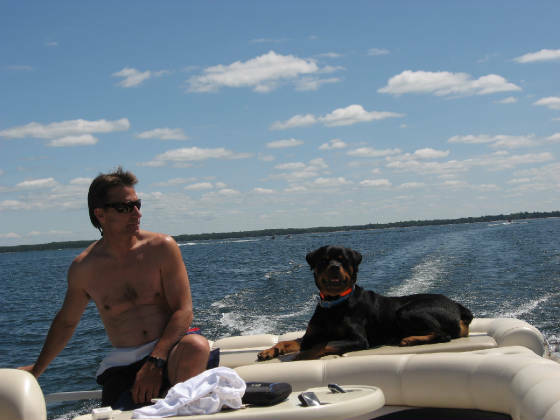 Pictured above is John Nachtsheim of Duluth, MN. 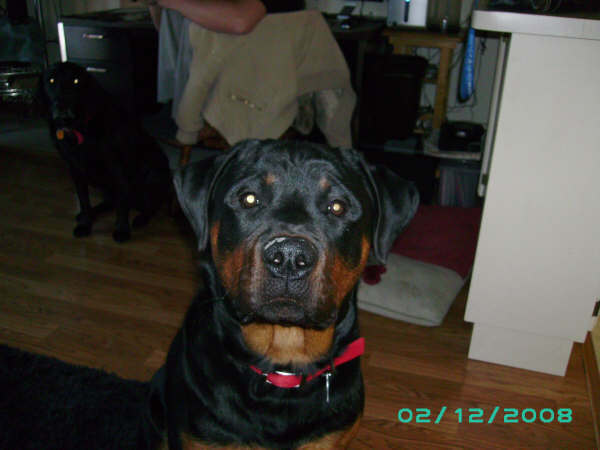 who puchased this handsome male from the Caillou & Nikki litter Born March 8, 2006. Thank you so much for giving "Redick" such a wonderful home. 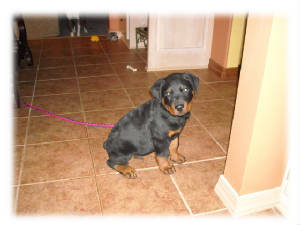 These pics are of Icey at 4 1/2 months old. What a wonderfully beautiful 47lb. bundle of love she is!!! Puppy training classes were a no brainer for her. She is so eager to please she amazed our instructor. 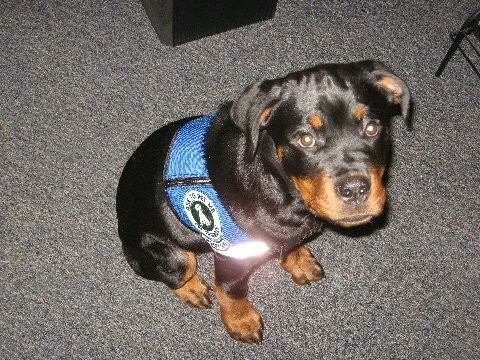 As you know we would like to show her and she will be a certified service dog as well. She is well on her way! We have started another round of formal obedience instruction and we are socializing her everyday. Her training vest arrived yesterday so we will be able to take her into stores as soon as the patches are sewn on. 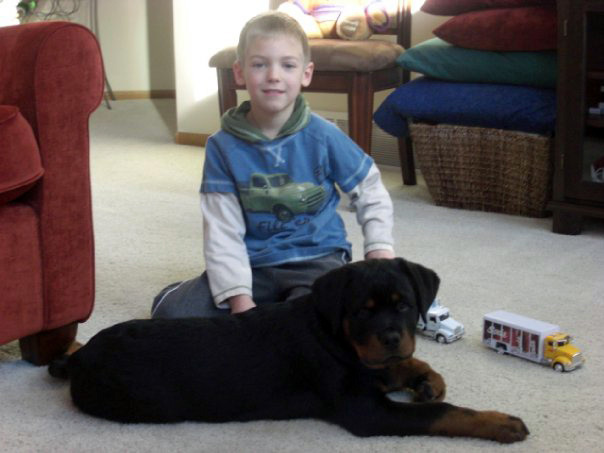 We started from day one playing obedience and "helper" games. Icey already helps unpack groceries by rolling canned goods to me as I sit on a stool. She brings me shoes, and pulls out and pushes in the diningroom chairs on command. She is getting very good at opening doors by turning the door knobs too. 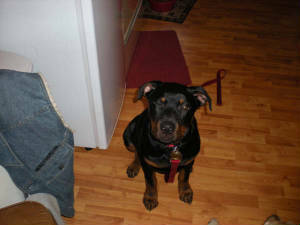 Icey has mastered the "sit", "stay" or "wait" commands as well as "down" (lay down) and the "walk on" commands. It may sound like she has not had much time to be a puppy but let me reassure you that she will play at the drop of a hat and does with great enjoyment. We cannot imagine life without her. 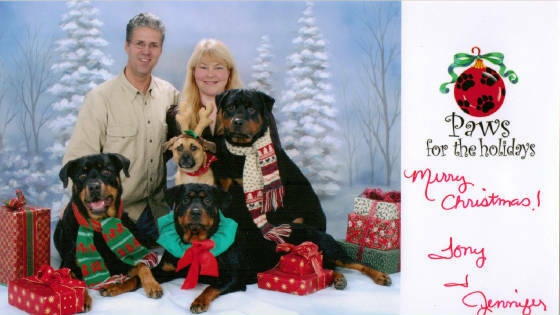 Thank you so much for your wonderful breeding program and true love for your dogs. I believe that if not for the amazing start she recieved from you she would not have reached this great height so early! 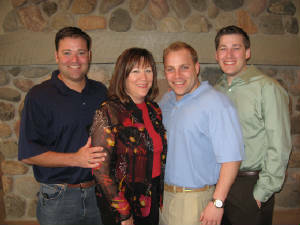 Adopted by: Al & Laura Fowler & Family of Detroit Lakes, MN. THE FOWLER KIDS & "ICEY"
Just thought I would drop you a note to tell you that Icey is doing GREAT!!! Got a clean bill of health from the vet. And as you will see from the pictures I am sending she has taken to life here at the Fowler house pretty well. She is an amazing dog! We are playing all sorts of games to get her used to doing things with me. he cuddles with her more than me! 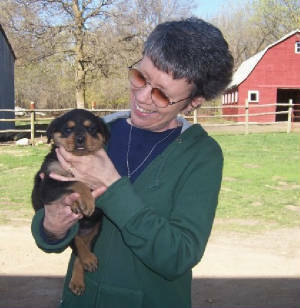 My Grandmother is so in love with her that she is talking about getting a rottie puppy for her self. Wanted you to know that all is VERY GOOD here and hoping that things are just as good there! This is a picture of "Minnie" with part of her family. 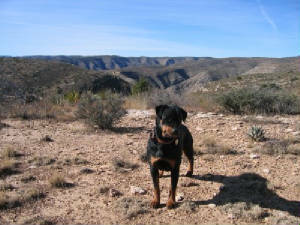 She was adopted by Sandi Carr of Buckeye, AZ., who eventually plans to do Obedience & Agility with her. Thank you so much Sandi for providing such a wonderful home for Minnie. This is Stanley Landis(from IL.) 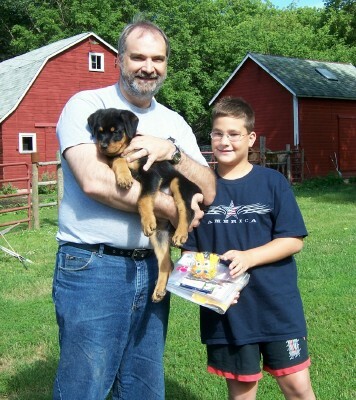 & his son with their new female puppy named "Jade" from "Caillou" & "Osa". They drove all the way here from Illinois. " Jade is a fantastic little puppy. We got home at 7:15pm yesterday. Jade was very good. We love Jade and all the family is very happy. God bless your family "
This is "Rigo" a male puppy out of Caillou & Macy. He was born Sept. 9th, 2005. 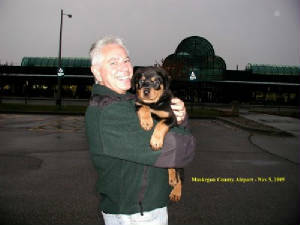 He went to his new home with Arnold Freiwald in Michigan on Nov 5th, 2005. Attached is a recent photo of Meadow. She will be a year old on the 14th already!!! So hard to believe that so many months have pasted so quickly. We just wanted you to know what a beautiful dog Meadow has become! We have completed basic obedience training & have received her Good Citizenship Award this past September. She is full of energy & loves to go on walks with me. Everytime we are out, someone comments on what a pretty girl she is - and of course we agree!! I frequently take her to work with me. My co-workers love her and she loves them back! As a matter of fact, she LOVES everyone. She greets everyone with LOTS of kisses. I have no reservations with her at all- she's even good with children. Meadow is a great companion and a wonderful addition to our family! Merry Christmas & take care. 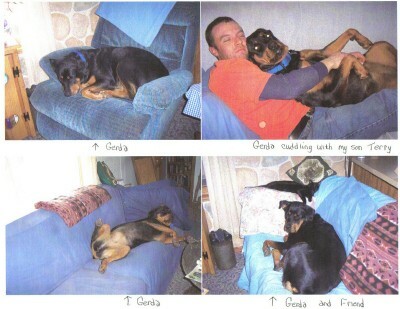 The three pictures above are of "Laci" who is owned by Mark Lovas. This is what he had to say when he sent these pictures just sent on January 2, 2006. 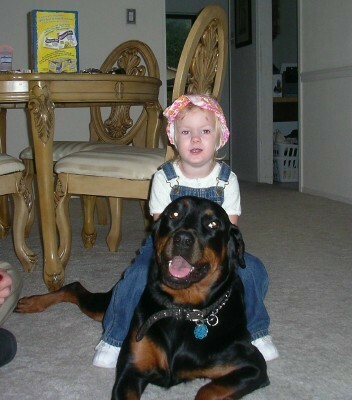 Laci has been a great rott and friend. She loves rides in our jeep while looking for "bunnies" and other furry creatures such as cows and deer. I take her camping with me all of the time and she is a great companion. Once again, I appreciate you for letting me have such a fine dog. 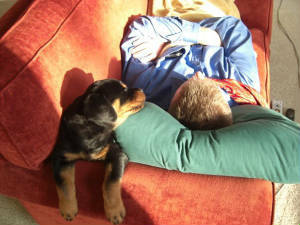 Here is another picture of Minnie at 5 months old curled up taking it easy. 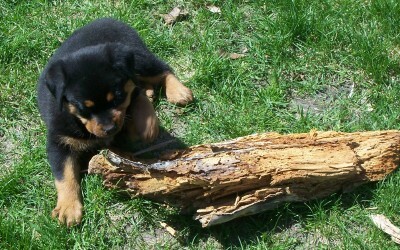 Minnie is a puppy out of "Caillou" & "Osa" litter. 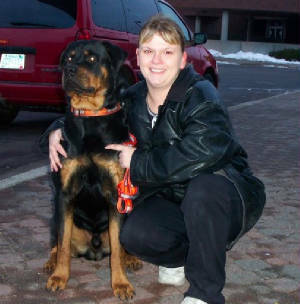 This is "Diesel" with his proud Mom Heather Smedstad of Anoka, MN. 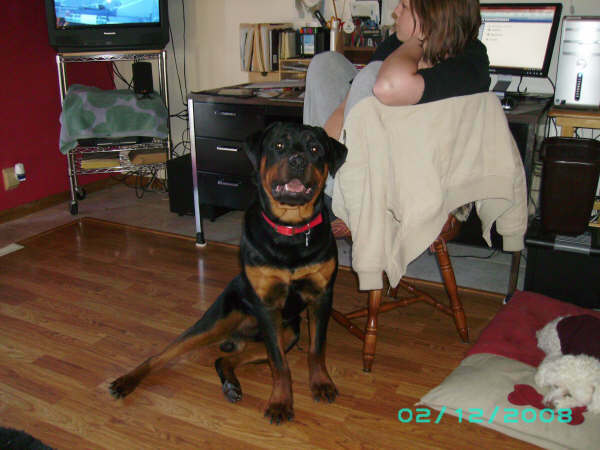 Diesel is 19 months old in this picture and seems very proud in this picture. He has a very nice personality and is great with Heather's young son and anyone else who approaches him. Hello there.. I just watched a show on tv about buying puppies on the internet and how not to get ripped off and it reminded me I haven't written you about Luna lately. 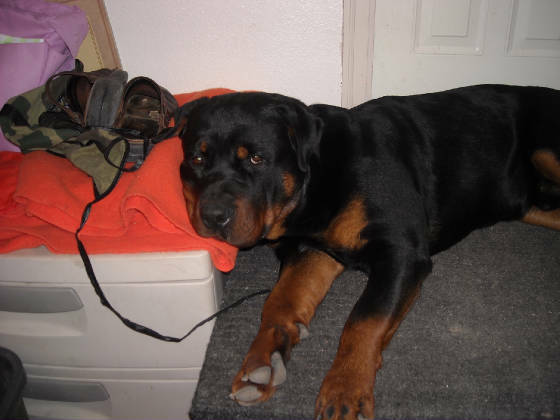 She just went to the vet last week for her shots and she was 98 lbs, I don't have a recent picture of her but I will and I'll send you a copy. Ohh and she is doing great... everyone loves her and she loves almost everyone...But the reason I wrote is if you ever need a reference about your puppies I'll give you a 'AAA' rating... you did everything right and nothing wrong... I was and still am very pleased..
since the day I brought her home. about sitting on your lap no matter how big she gets! go people STOP ME to tell me how gorgeous she is.